Katherine: This is a serious looking pen. But not too serious. All three finishes (amber, smoke and clear) are demonstrators, but the amber and smoke aren’t obviously so. As usual, the cigar shape isn’t my favorite, but I like the way the translucent amber and smoke materials look with ink sloshing around. 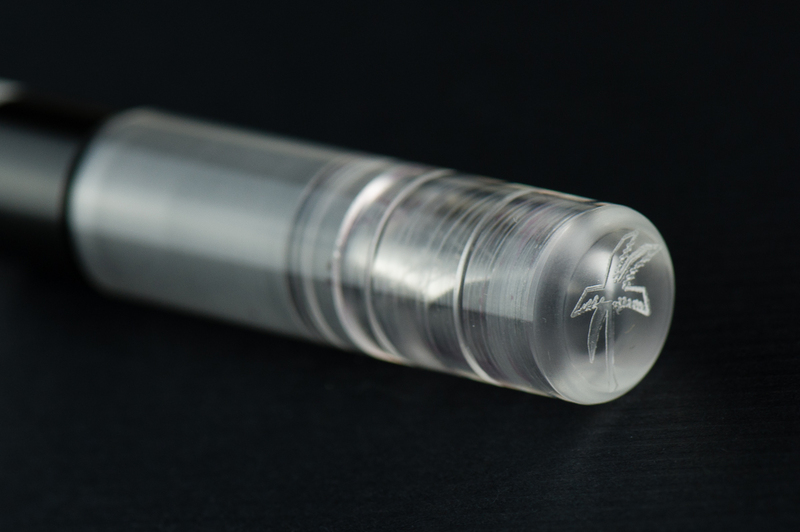 My long time gripe with the clear one was that the cap liner (on all three, but most obvious on the black) is black… and very obvious. 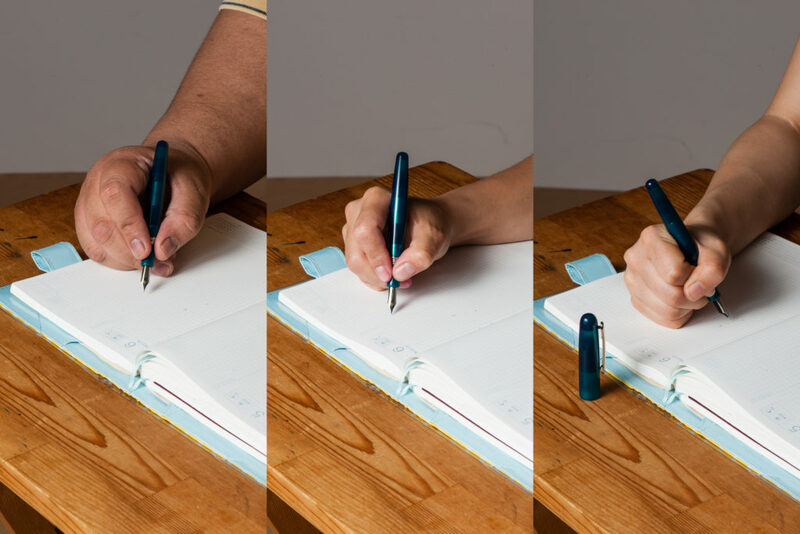 BUT, I’ve recently discovered that it’s not hard to remove the cap liner — a fat eraser (like one of the ones on those easy grip chubby kids pencils) can easily pull it out. Then it looks oh-so-much cleaner! 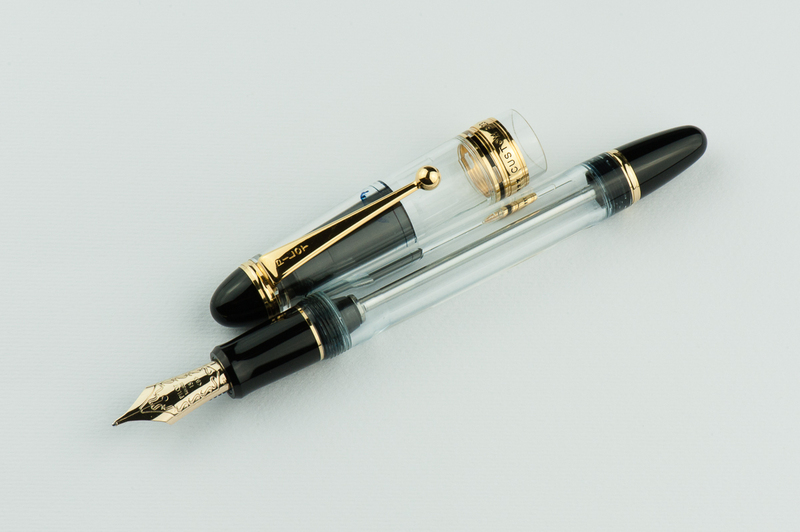 If this pen came in the 912’s styling (flat ends, rhodium trim), it would be a must-own for me, instead I very much enjoy it, but I’m not in love with the way it looks. Franz: Now I feel out of place. 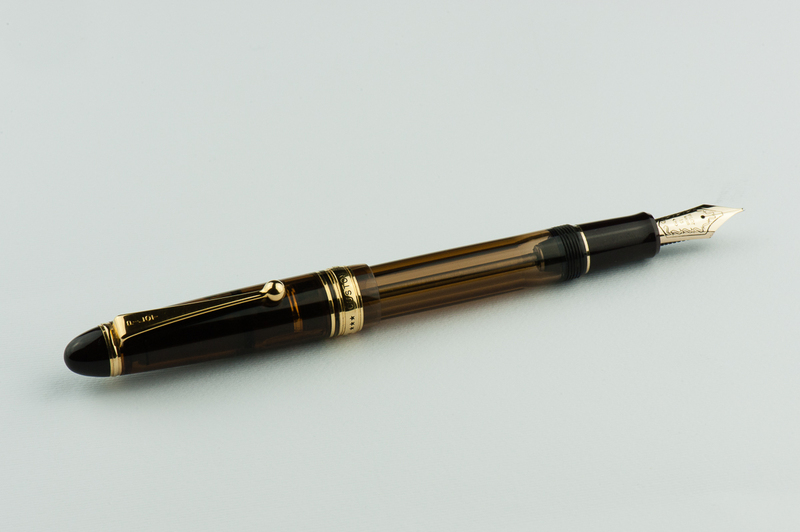 I love cigar shaped pens but the Pilot Custom 823 is more torpedo shaped, no? Hihihi… Either way, I love the 823’s shape and for some reason, that smoke finish is a winner for me! The 823’s size is substantial in the hand but at the same time it’s not too big, if that makes sense. 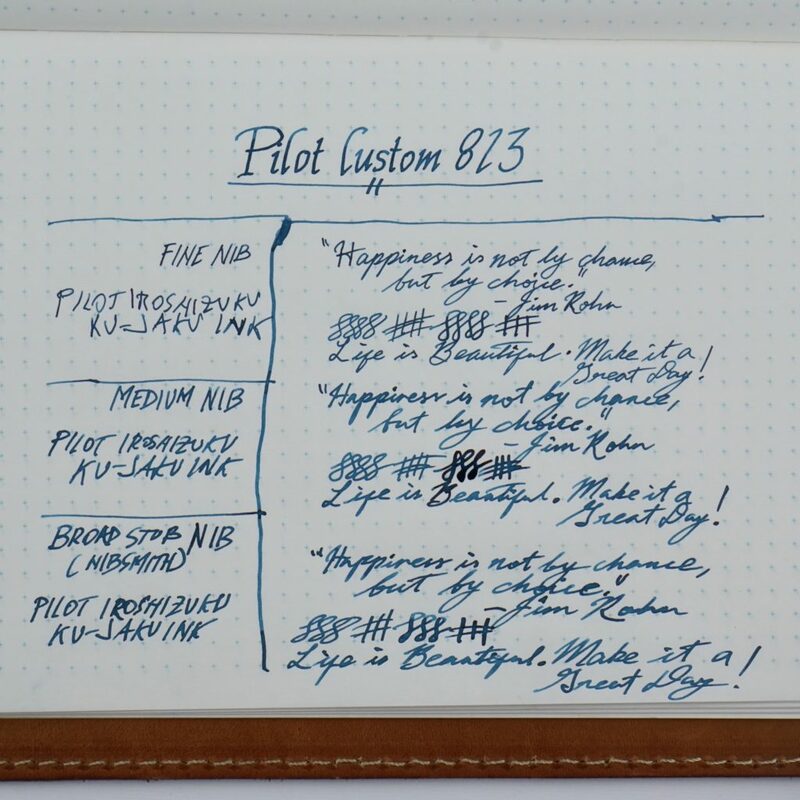 Just like what we learned in our review of the Pilot Custom 912, Pilot assigned a lot of their pen model names according to the company’s year when they were introduced. 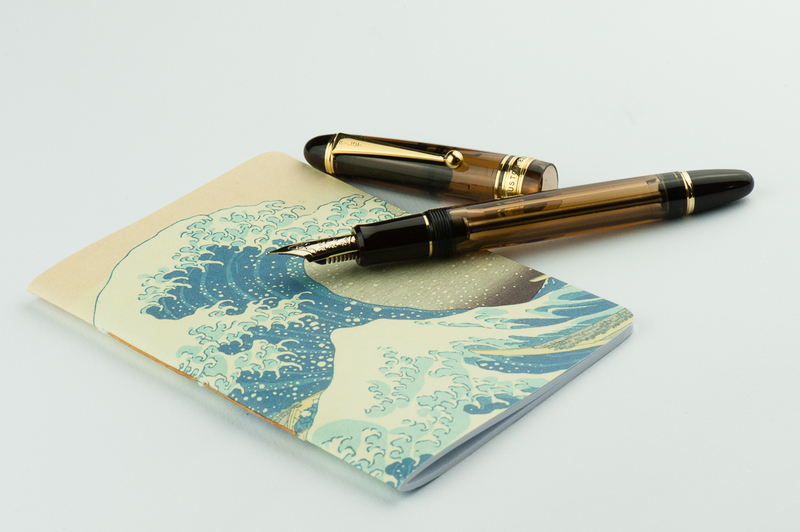 Namiki/Pilot was founded in 1918 and they are celebrating their 100th anniversary this year as well. 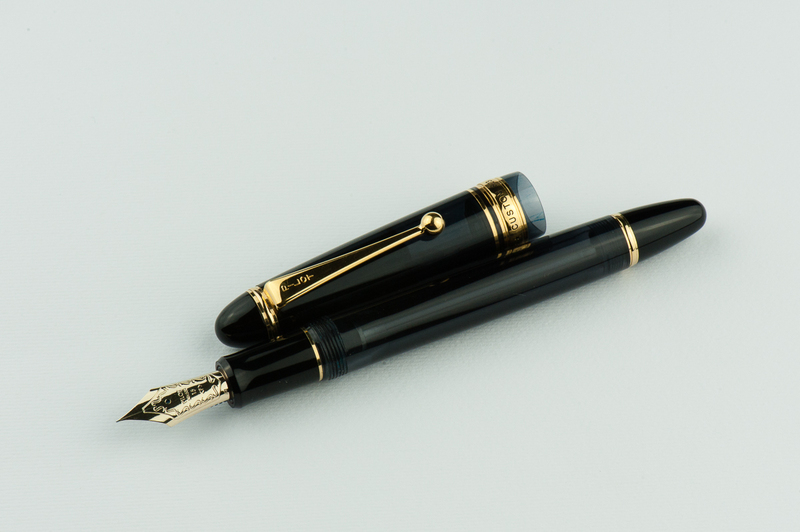 So for the Pilot Custom 823, the first two digits (82) mean that the pen was released in Pilot’s 82nd year, 2000. The third digit represents the manufacturer suggested retail price in 10,000 Japanese Yen, ¥30,000. Katherine: Yay for Pilot #15 nibs! I really enjoy them. The medium on this pen was no different — a wonderful balance of smooth and wet, but not overly so in either direction. 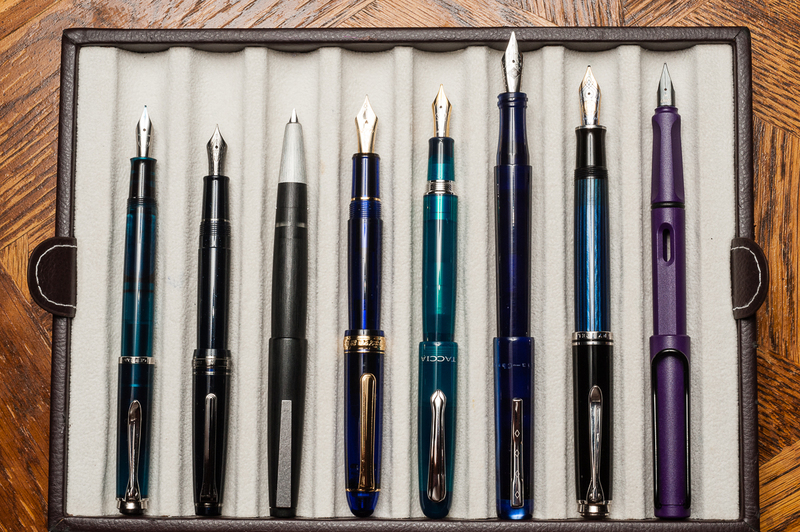 I’ve also had the pleasure of using a handful of other nib sizes on 823s and have been quite happy with all of them. Personally, I own a #15 FA, and love the bounce (the #10 I own is softer/flexier) and smooth writing it gives me. 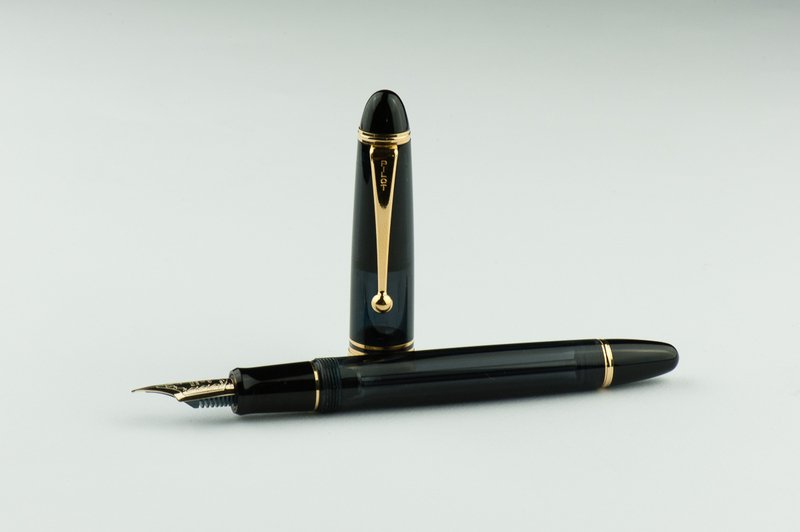 Pam: Franz was kind enough to allow me to borrow a 823 with a fine nib. What a nib!!! It’s honestly everything one could love about a Pilot nib. 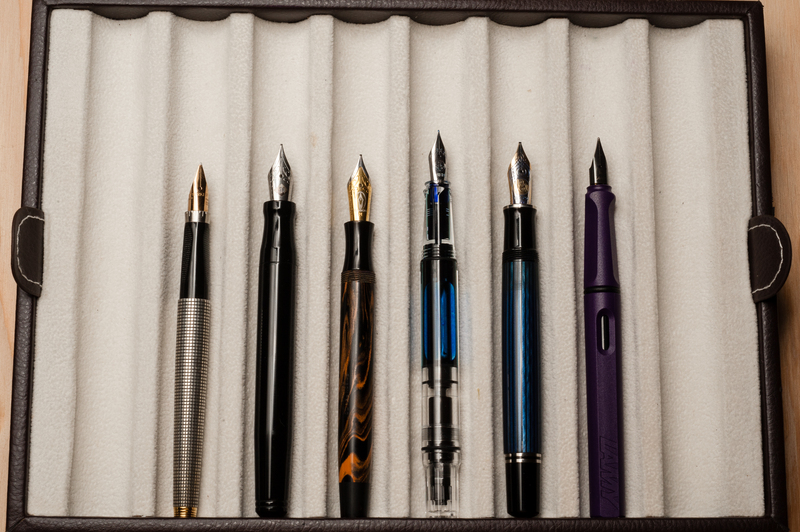 Granted, my experience with Pilot is limited to a few select pens (Elite, Myu, m90, Murex, Volex) and I typically use the Pilot Prera and Vanishing Point at work. What was quite different about this particular nib is the size; it’s so big!! It’s also a great “upgrade” in both size, material and performance. Franz: The 823’s nibs are very pleasant to write with. No adjustments were necessary to provide a great writing experience. 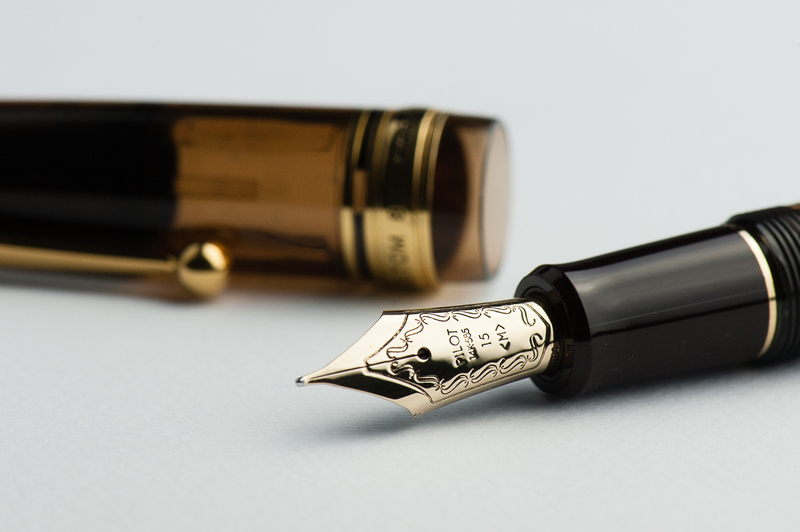 However, among the three, the broad nib was modified by Mr. Dan Smith into a juicy stub. The medium and fine nibs had a good flow as well. 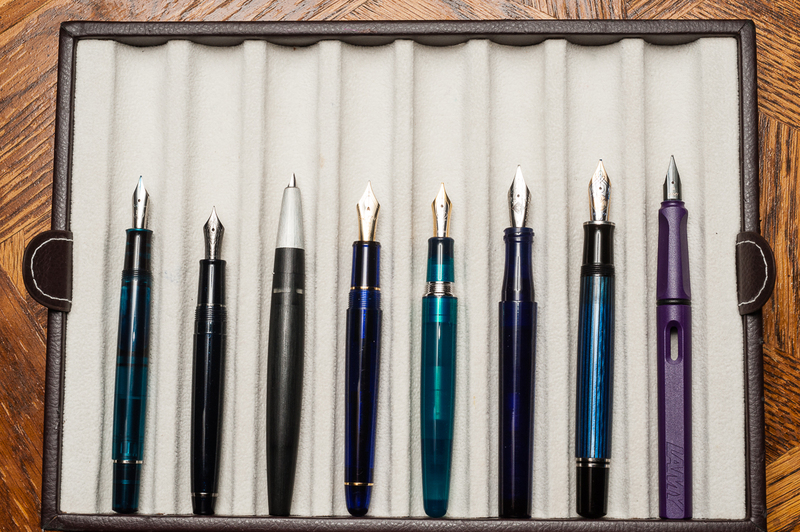 The 823 nibs definitely have the bounce to give that flair in your writing. Katherine: I thought the 823 was overhyped until I borrowed one from Franz for this review. 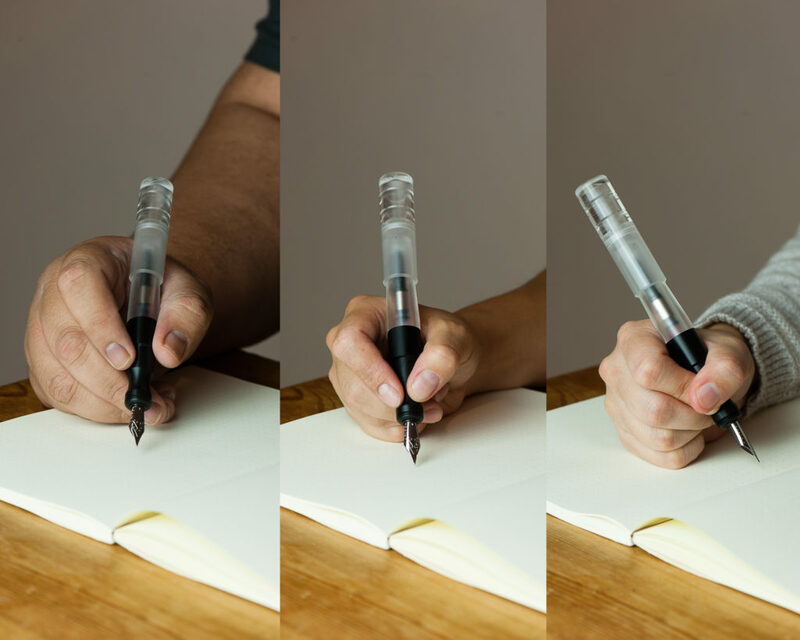 As I wrote with it (and stared at it, trying to settle my feelings on its aesthetic) I realized why it’s such a popular pen… It’s a solid workhorse of a pen that writes wonderfully and feels solid and comfortable in the hand. It’s not too big, not too small, not too smooth, not too feedbacky… Somehow it’s a fantastic balance on so many axes (plural of axis, not that I’m balancing pens on wood chopping implements). I guess it’s implied, but I had a great time writing with it — though I did forget to loosen the knob the first time and was momentarily vexed as I wrote the feed dry. Pam: I didn’t just write with this pen for an extended period of time. I “borrowed” this pen from Franz for an extended period of time. It’s has just enough stiffness and give from the material and size to make the writing experience tactically enjoyable for me. I found the pen to be very well balanced unposted. It’s a bit tall for me posted. The ink in the chamber is a bit mesmerizing. The nib was Pilot smooth with little/no feedback. The nib performed surprisingly better than I expected on cheap office paper. It didn’t feather as much as usual. 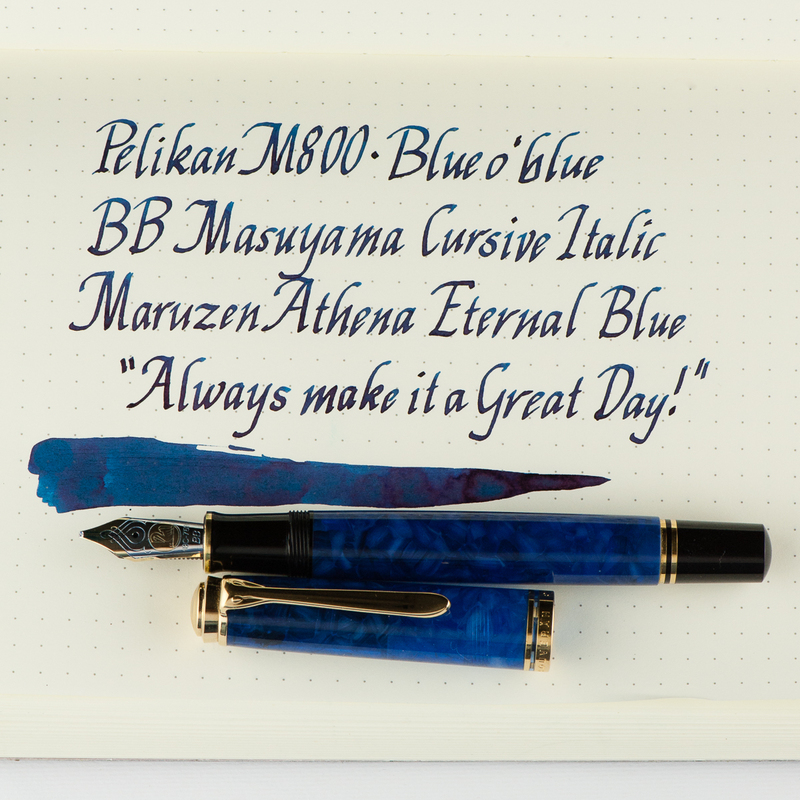 Ink used was Pilot Iroshizuku Ku-Jaku. The pen and ink combo shined in both my Midori insert and Hobonichi (Tomoe River paper). 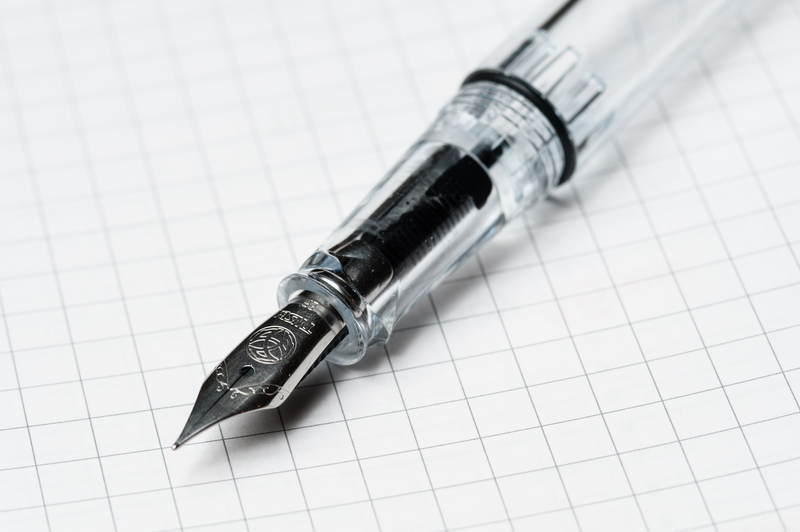 Franz: The biggest thing that I love about the Pilot 823 is that there isn’t a step between the barrel and section and that the threads aren’t sharp. When the cap is posted it is plenty long for my large hand but like Pam, I prefer to write with the pen unposted because the weight is more balanced. So with fingers on the threads, the unposted length is very comfy for me. Katherine: Solid clip, 1.75 turns to uncap and an ink capacity that lasts pages and pages and pages. And it low-key looks so your boss doesn’t wonder why you’re writing with a glitter stick. But some oooh and aah when your teammates notice the ink sloshing around inside. Pam: I loved this pen at work. It was less than two turns to get you writing and as previously stated, the F nib does a pretty good job on office paper. The clip was just enough to easily slip in and out of a my white coat pocket with little issues. The ink capacity of this pen is fantastic and by far exceeds my other EDCs for work. 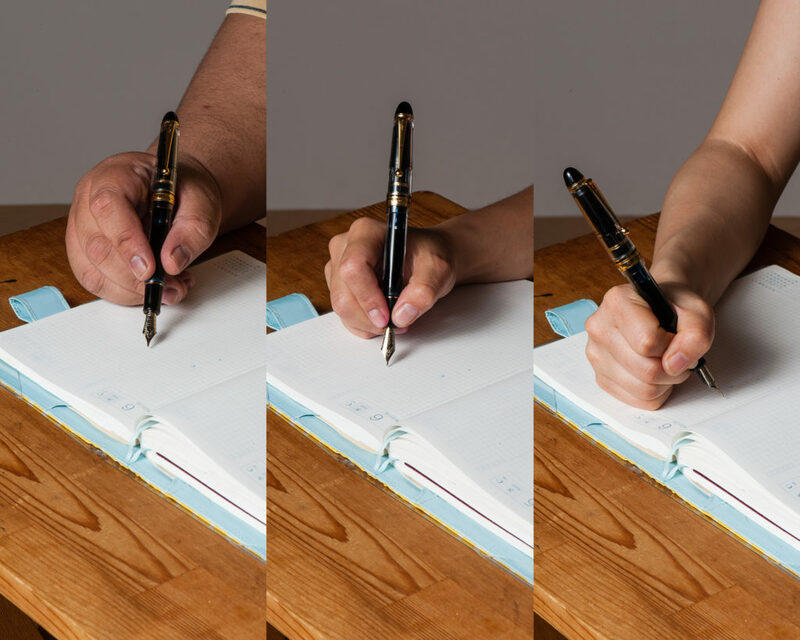 For quick note taking, the VP is the height of convenience. However, for end of the day wrapping up “thought gathering” and where you have an extended note-taking session, I kept reaching for the 823. I may be adding another Pilot to my pocket for work at the rate we are going. Franz: The 823 is a great companion for use at work and when I’m out and about. The fine and/or medium nib was great for the copier paper in the office and it just wrote well. The ball clip is sturdy and fits onto my shirt pocket as well as my jeans pocket. 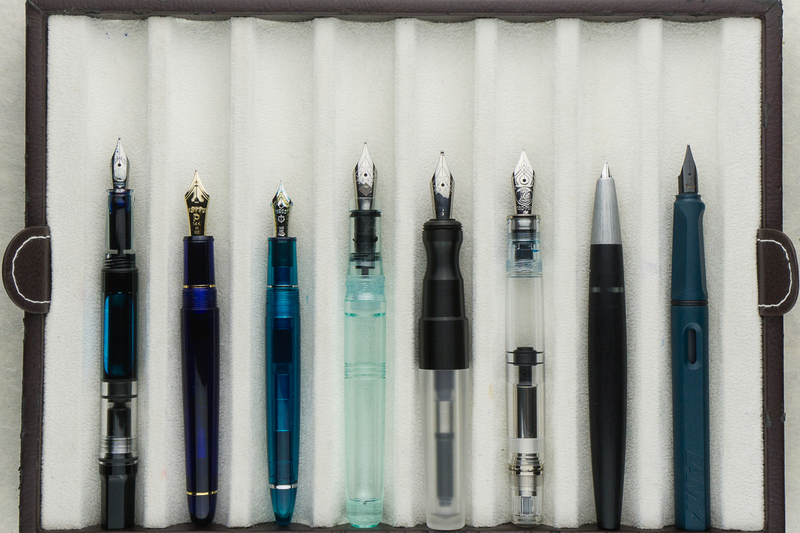 The biggest advantage of the 823 is its ink capacity. 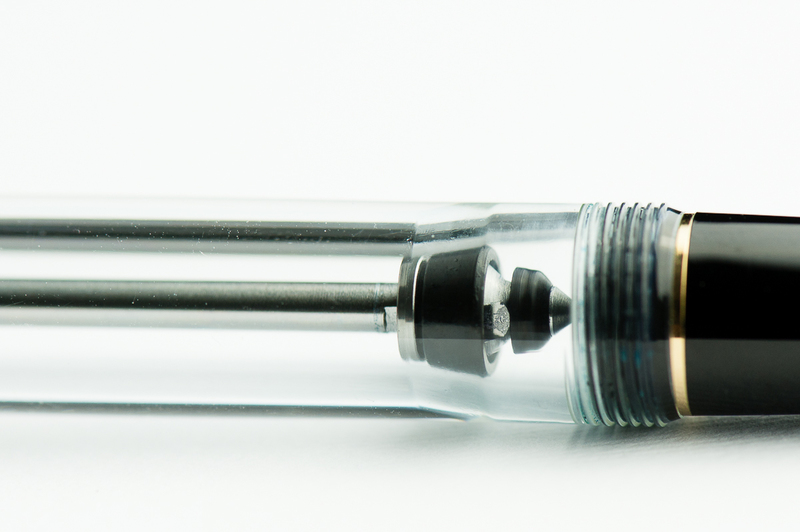 When you operate the vacuum filler (pictured below), the pen gets about 75% filled up. 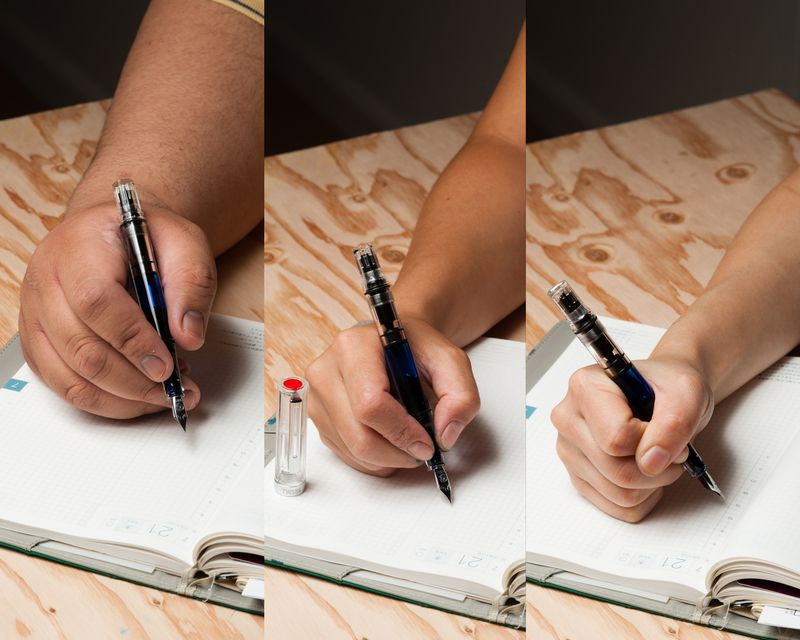 There is a maneuver you can do to fill the pen 100% of ink which is about 2.5ml. 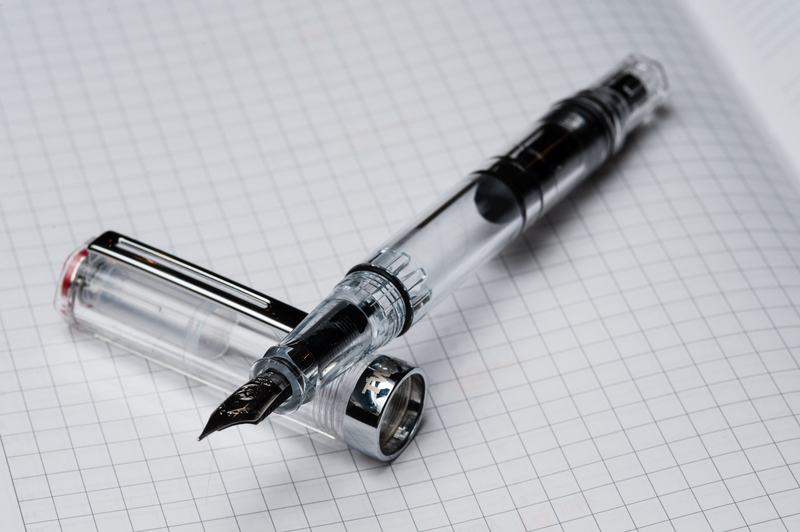 Dan Smith shows this in his video review of the Pilot Custom 823 here. As Katherine described earlier, the 823 does have a shut-off valve (second picture below) and you need to unscrew the knob to make sure the ink flows freely onto the reservoir and feed. Gotta make sure that it is unscrewed or else you’ll find the nib writing dry after a page or two of journaling (trust me, I know). 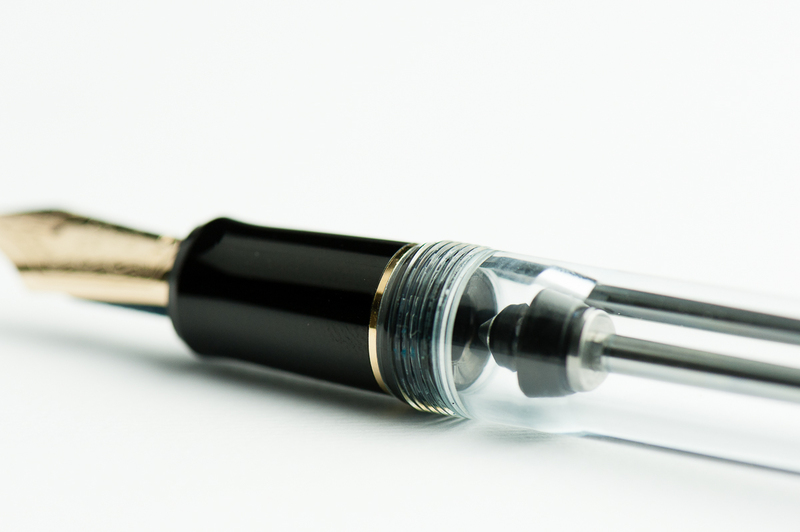 The shut-off valve helps contain the ink when you are flying, or if you are shipping the pen filled with ink. I received my 823 filled with ink in the mail from my friend and aside from ink spots in the cap, no other ink was wasted. Katherine: The 823 is a solid pen. It’s not my favorite aesthetically, but I’m more than willing to forgive it that for how well balanced of a pen and nib it is. 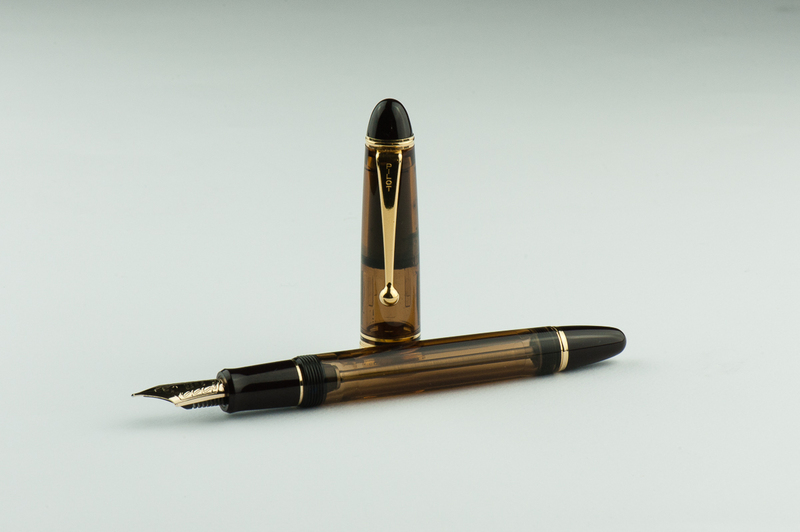 However, at $250-300 new, it’s not a pen I’m in a hurry to acquire (well, also because I arguably have more than enough pens…) but I do one day want to own one with an FA nib. 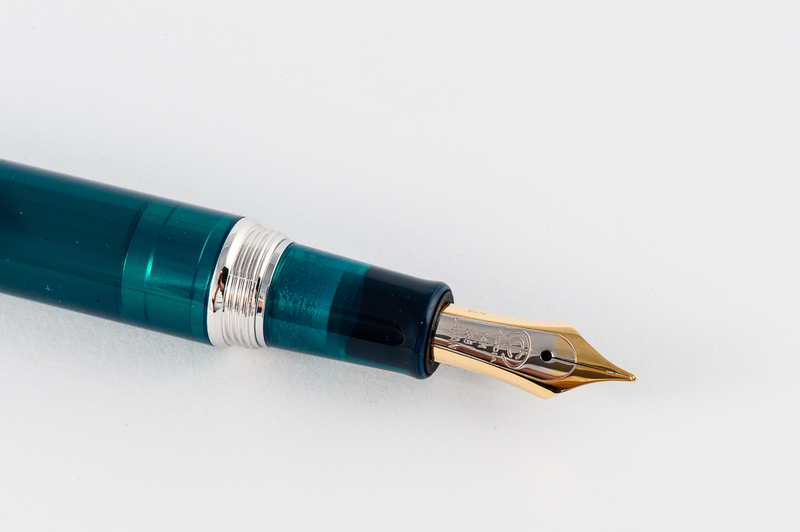 I’m sure this will upset someone, but the 823 reminds me a lot of another pen I love, the Pelikan M800 — solid workhorse pens with an ink capacity for days and a clean professional vibe (assuming you aren’t sporting a maki-e M800 or something). 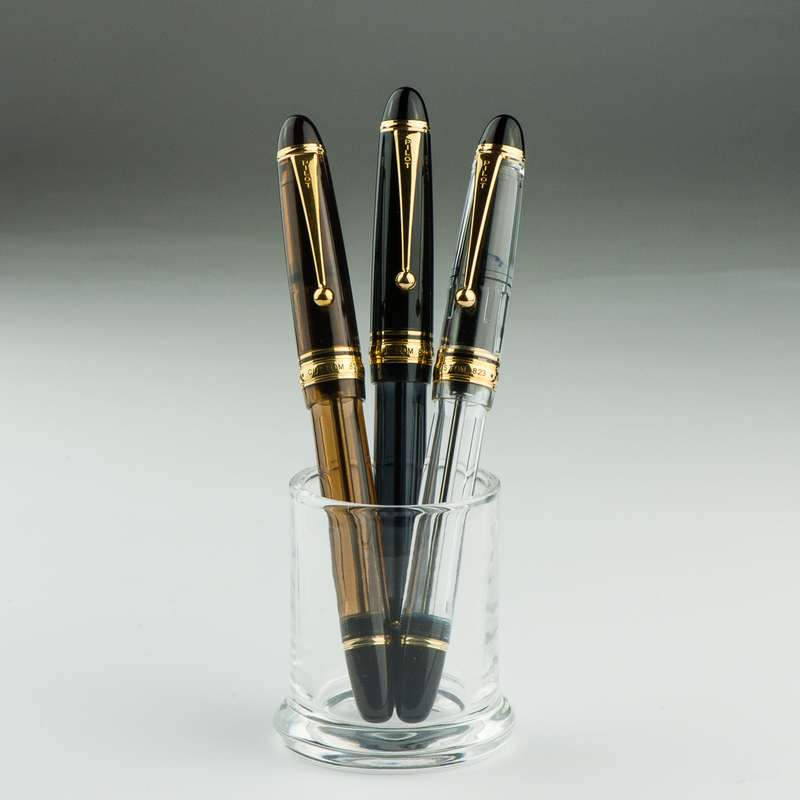 If you like cigar shaped pens and gold trim, I don’t think you can go wrong with the 823. Pam: #PenAddictProTip I agree with Brad. As in you should try the 823 for yourself. I believe that this pen is in the “everyone should try it or own it” category, like the Lamy 2000. 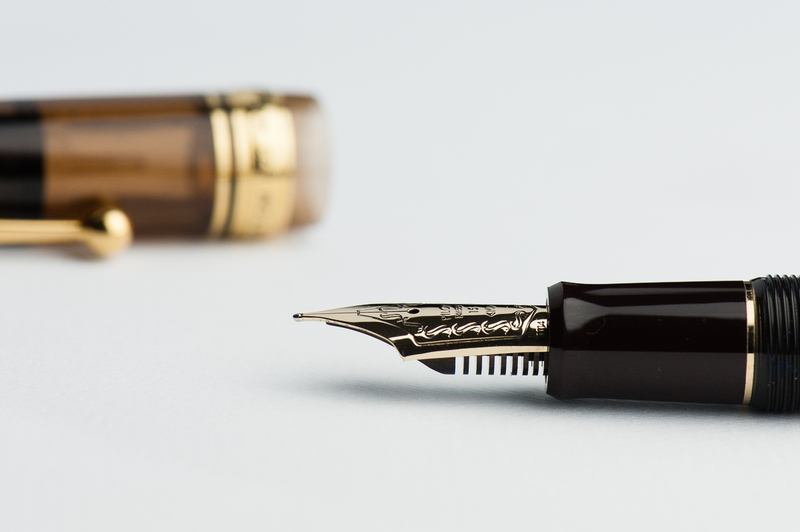 You may not like it, but it’s a pen that is so easily and quickly reference for what it brings to the table: a LARGE gold nib, piston filler, a classic shape with a modern twist and a fantastic writing experience. It is well deserving of the “pens you should know” pantheon. 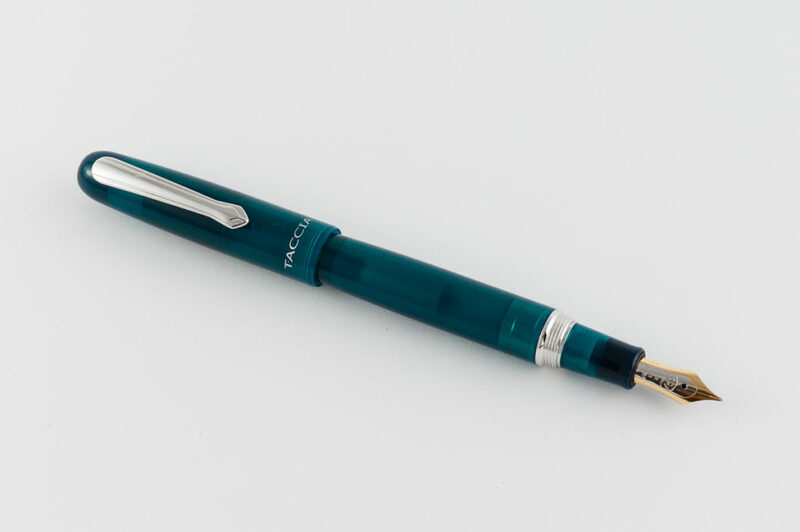 The price maybe a sticking point, but I have had such a great writing experience with this pen that if you enjoy it as much as I did, it may well justify the price for you. 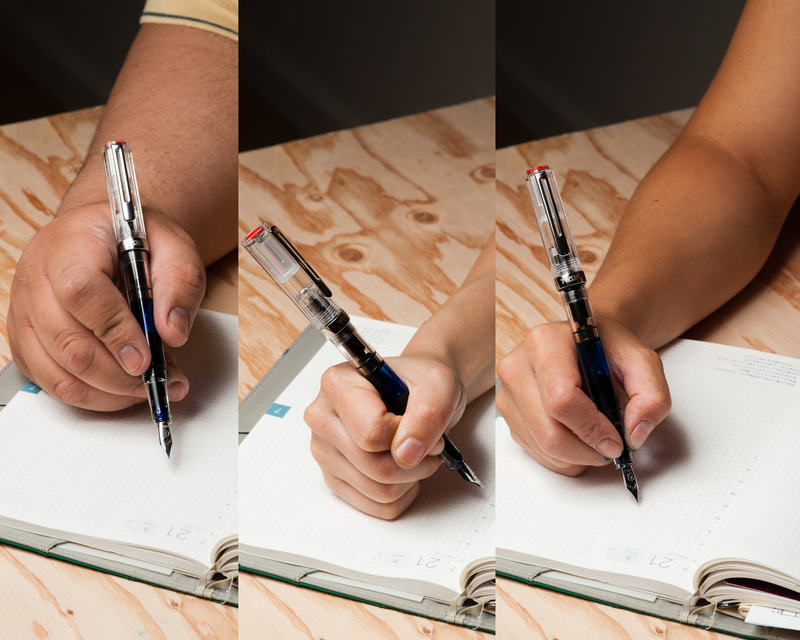 Franz: Well, if you haven’t noticed yet, the Pilot Custom 823 is a definite win among the three of us. 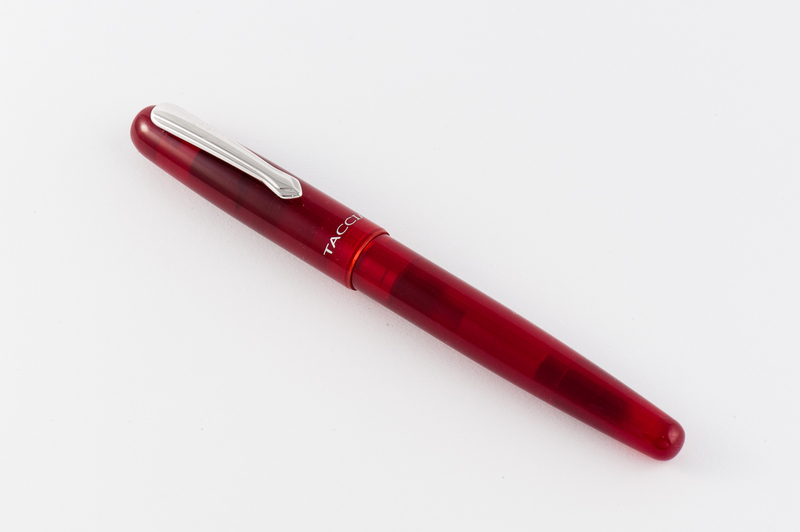 It is a decently sized pen with great balance and is a great fit for small to large handed writers. Currently in the United States, only the Amber finish is available. I really wish that the Smoke and the Clear finishes would be made available in the market. You may purchase the two finishes from Japan sources if you are patient and knowledgeable enough to do so. I was lucky enough to secure my Pilot Custom 823 in Smoke from the secondary market. 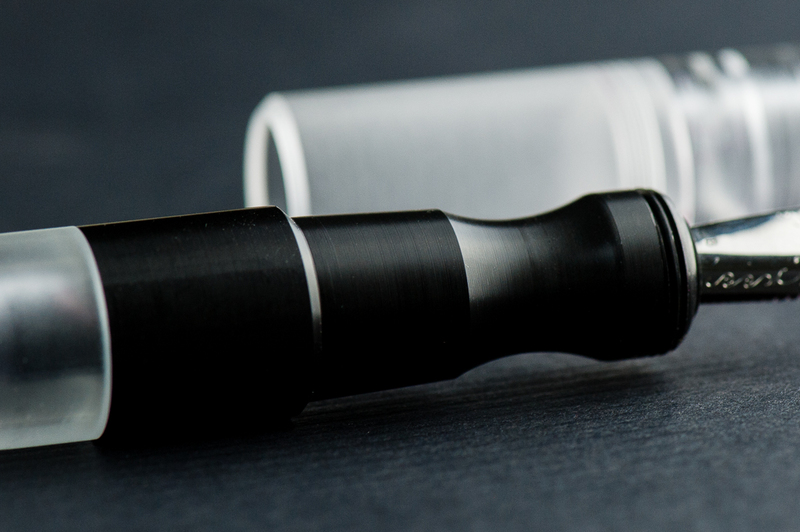 You can call it a cigar-shaped, or a torpedo-shaped pen, it doesn’t matter as long as you try one. It’s a fantastic pen for me and I’m happy I own one. The Taccia pen company was very generous in letting us review their Spectrum pen line. Multiple units were provided so we were able to try out their steel and gold nibs. We very much appreciate this opportunity! And special thanks goes to Ron L. for connecting us with Ms. Shu-Jen. As always, the opinions here are our own and we were not compensated (monetarily, or otherwise) for this review. Katherine: I’m not a big fan of the aesthetics of this pen. I think the colors are pretty, but the semi-opaqueness (you can see the converter, but it’s not really clear enough to be a demonstrator) just isn’t my thing. I think it looks messy. But, that’s the super, super subjective part of this review. On we go! 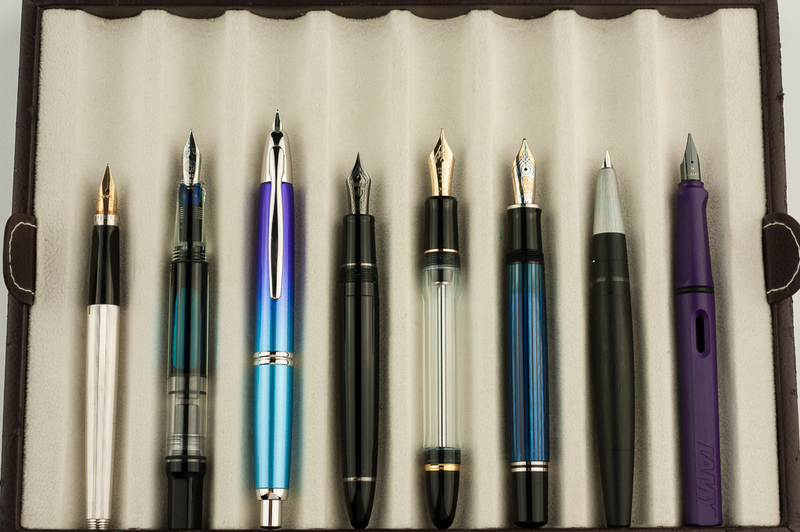 Pam: The Spectrum is a very modern feeling pen with both the shape and material. 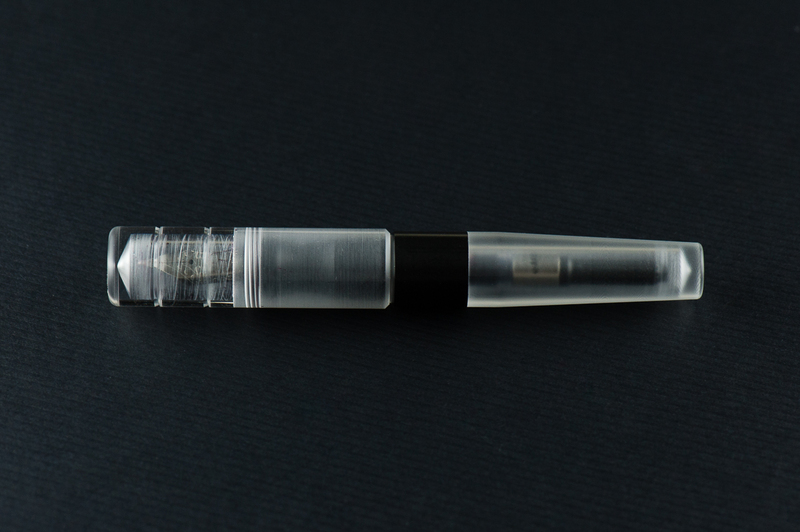 The material with the odd balance of translucence and opacity gives the pen a “space age” feel for me. I do really enjoy the different colors. Each of them are rich and very pleasant. 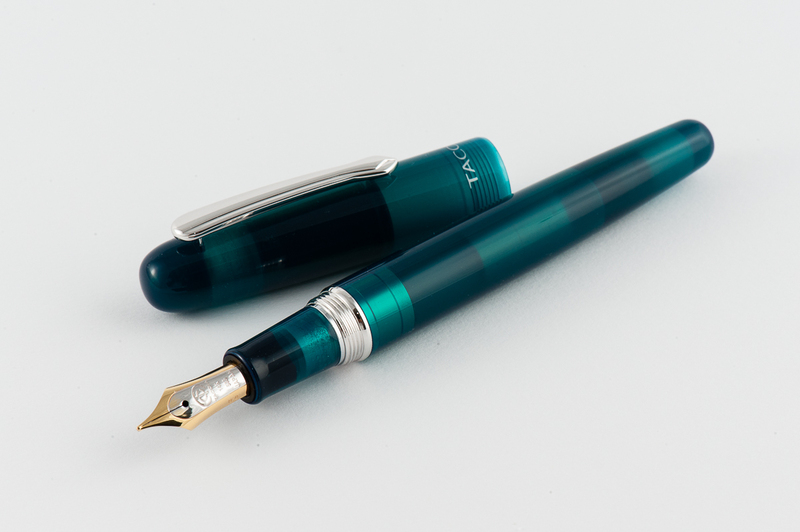 My favorite is the teal, it reminds me of one of my favorite inks, Yama-dori. 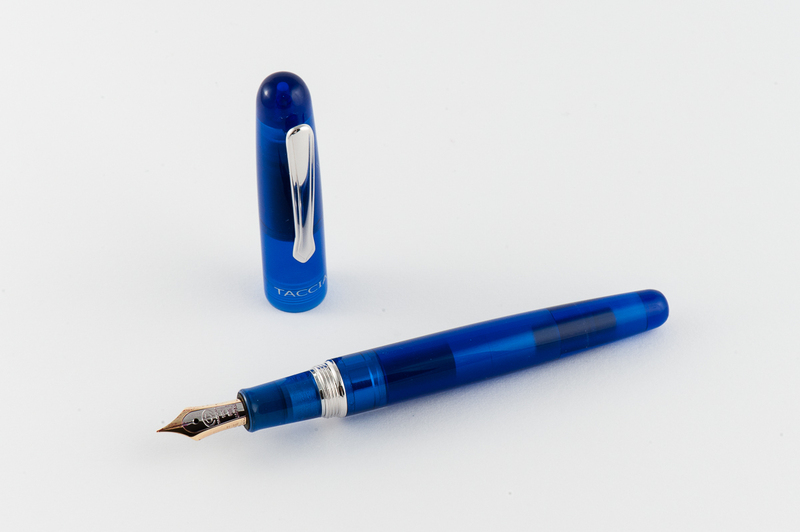 Katherine: The Taccia nibs are apparently made by Sailor. 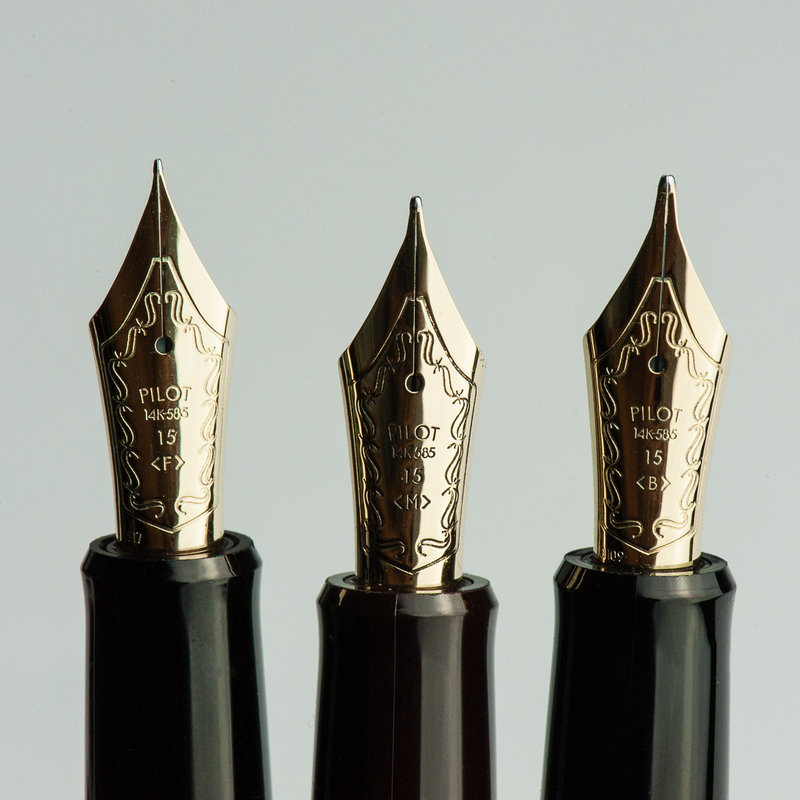 Interestingly, they look like Sailor nibs, but seem to be tuned differently (and it’s not necessarily a bad thing). The steel nibs are wetter than the comparable Sailor nib widths (though we were comparing against gold Sailor nibs) and have less of the signature Sailor feedback. It feels like a nib smack in the middle of Sailor feedback and fineness, and a western nib that’s a little smoother and wetter. Nice, but not the same as a Sailor nib, which is what I initially expected after being told they’re made by the same person. 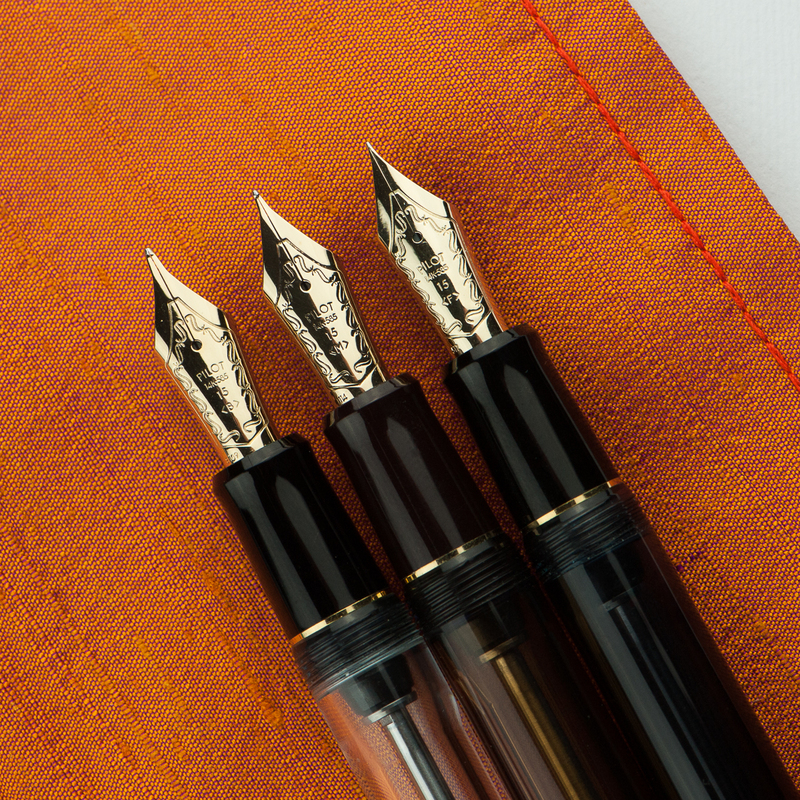 The gold nibs (Thank you for sending us the range, Taccia!) 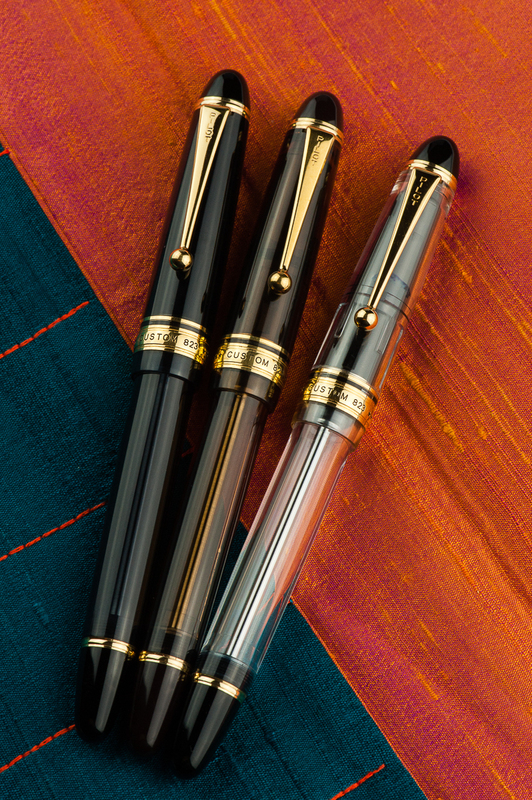 were even more western feeling, smoother and broader than the equivalent Taccia steel nib and Sailor gold nibs. What a difference tuning makes! 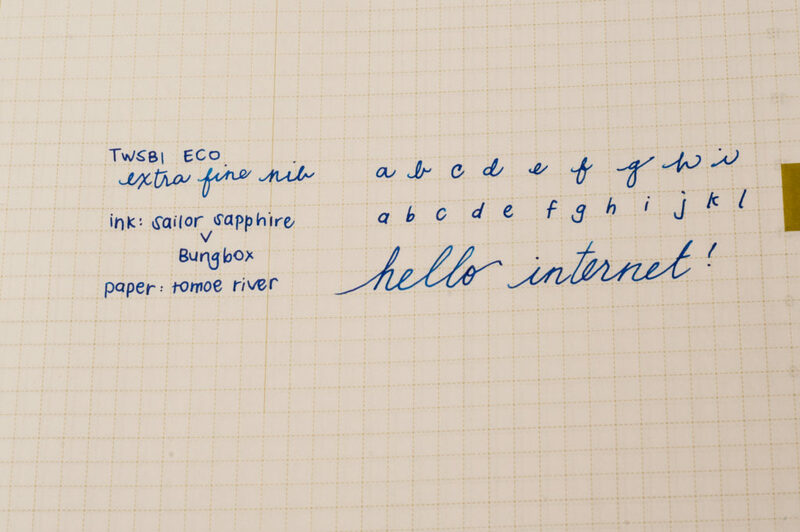 Pam: The non-Sailor Sailor nibs did not perform how I expected. 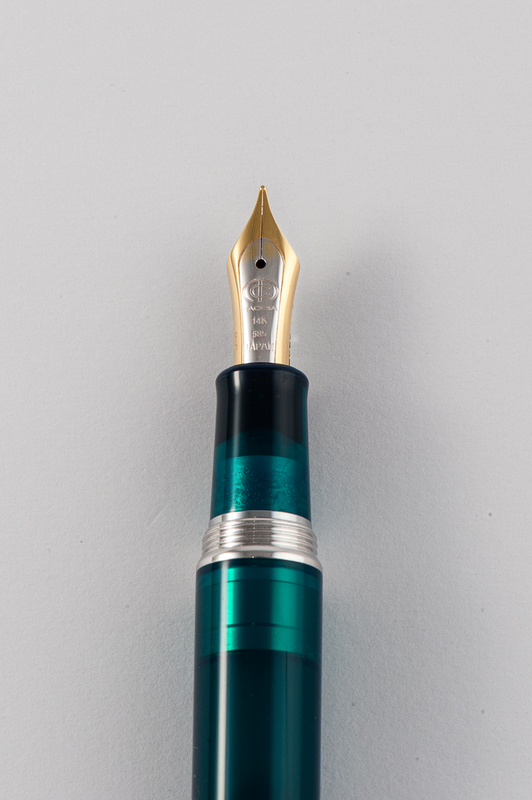 I was expecting it to perform like the Sailor nibs that I love and adore. 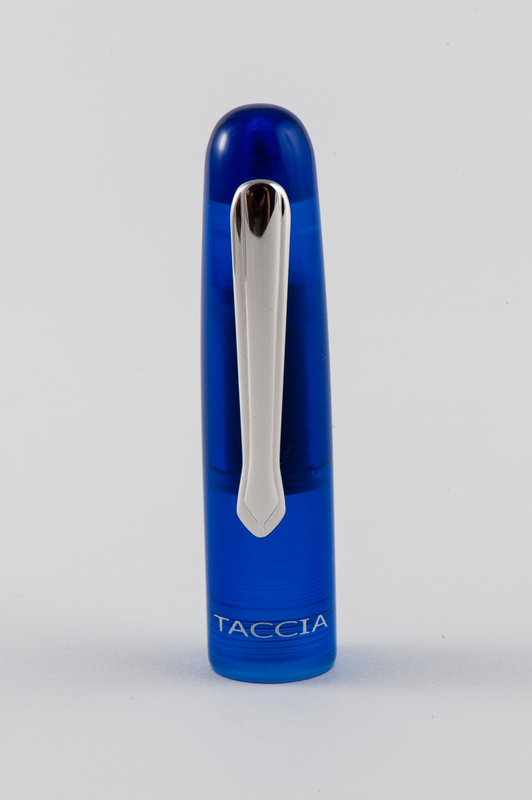 Instead, I felt that the steel nibs from Taccia was a big improvement of the Sailor steel nibs. I find the Sailor steel nibs to be really dry. The Taccia gold nibs provide slightly more feedback for me and also provide a wider line width. 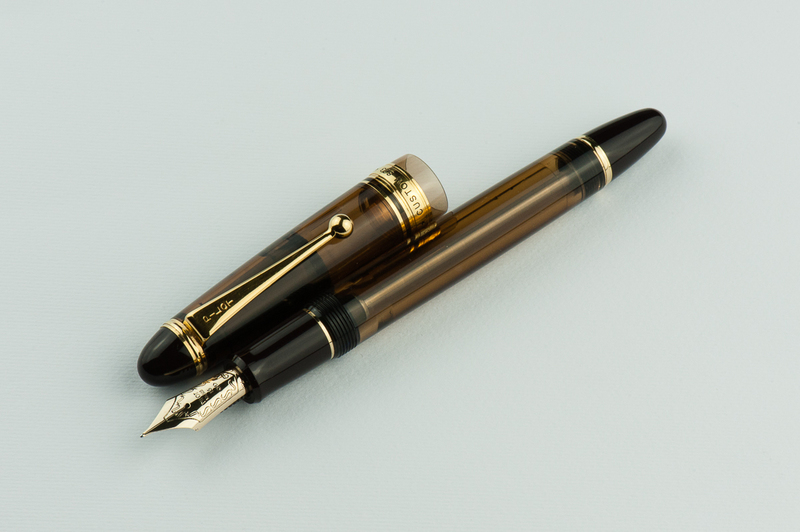 I prefer the Taccia steel nibs and the Sailor gold nibs for my writing style/purposes. Comparisons of the nibs and how they perform on Rhodia paper in the picture below. Franz: Taccia sent us 8 pens to try out and compare their steel and gold nibs. This ranged from fine to their music nib size. They sent us their “Spectrum” of nibs! 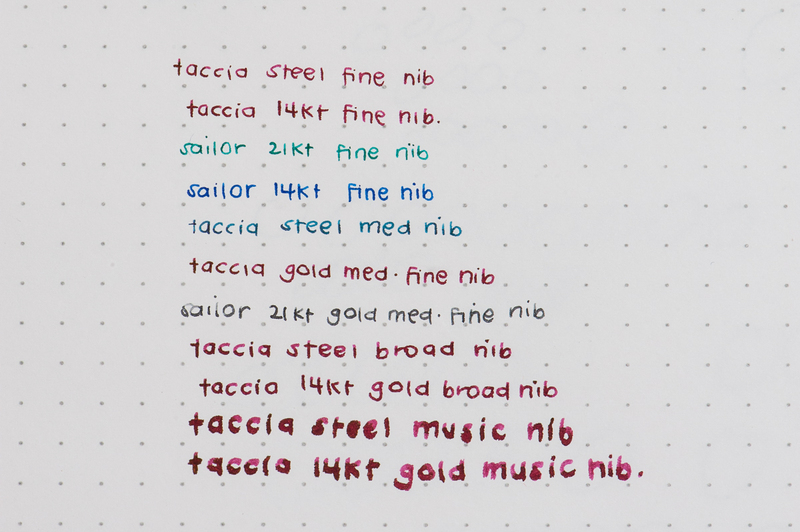 And yes, these nibs are made by Sailor for Taccia. 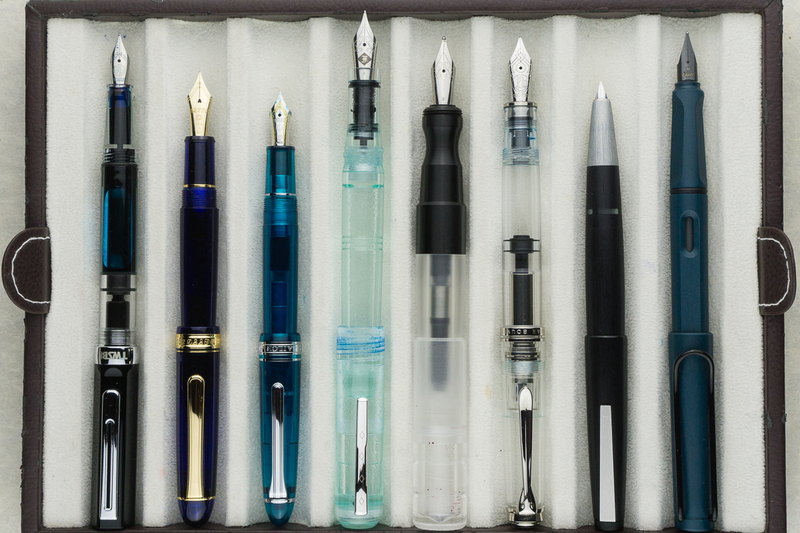 We really appreciate being able to write with the different nibs. 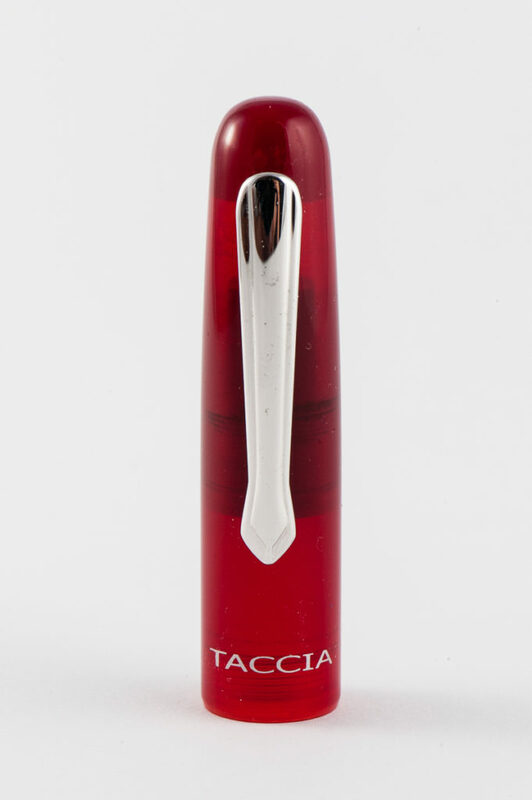 Aesthetically, I like the engraving on the steel nib as it gives a nice border to the Taccia brand. I had the same experience as the ladies above in that the steel nibs seem to be much smoother and less feedback-y and I liked that. As for their line widths, they seem to be the same to me but the 14k gold nibs do offer a little more bounce so the line width can be thicker. Also, the music nibs are so fun to play with and I got to write on a letter with it! Katherine: I journaled quite a bit with this pen. Overall, I found it comfortable, but a tad bit heavy, perhaps because of the metal section. 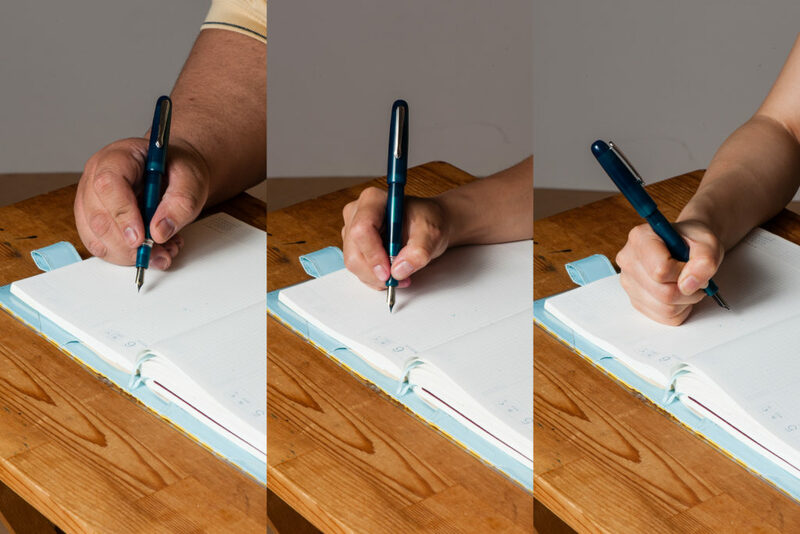 I did notice that after extended writing sessions, my hand got tired feeling — but took quite a bit to reach this point, so I don’t think it’s an issue. Pam: I really enjoy writing with the pen. I prefer to write with it unposted due to length. It’s a bit front weighted and it can tire the hand. I found the width of the pen to be quite comfortable. Overall, it does well and I have no real complaints about the pen during a lengthy writing session. Franz: Let me tell you right now, I did not journal with the Spectrum unposted as it is too small lengthwise and the section is quite thin. And the lip where the cap meets the pen dug into my finger. So posted it is! And posted, I found this pen quite comfy as I grip it on the barrel above the threads. The cap gave the pen balance for me and I did not feel any hand cramps after almost twenty minutes of writing. 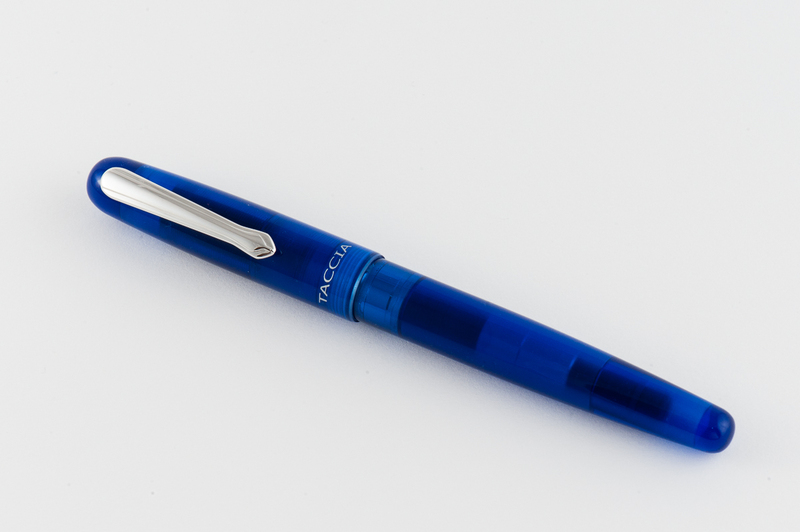 Pam: I kept the pen in my Nock Sinclair for several days and it did wonderfully! It gave me no trouble whatsoever. Franz: As I used the Spectrum at work with its medium steel nib, I found it wrote nicely on copier paper. For quick notes, I can write with the pen unposted so it was a nice experience. And my co-workers loved the color of the Forest Green too! My one nit is that it takes two and 3/4 turns before it uncaps. Kinda too long for my constant need to use at work. 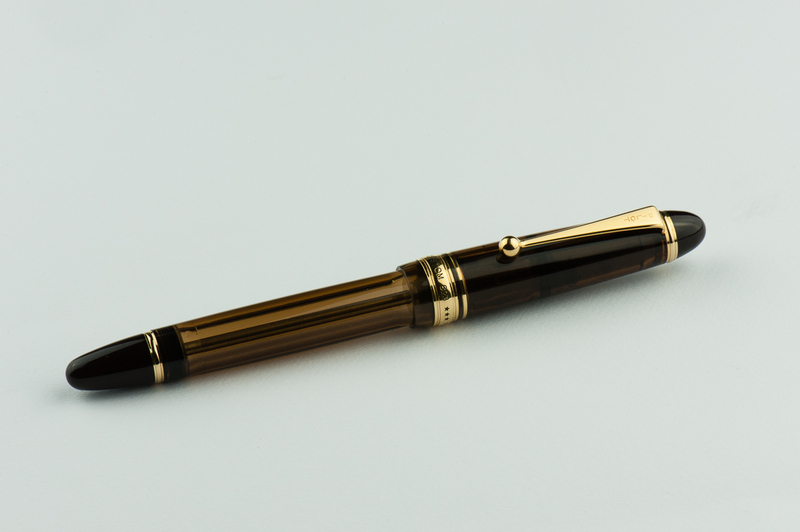 It’s a good pen to just stay on my desk during the day and write when I get to sit down. 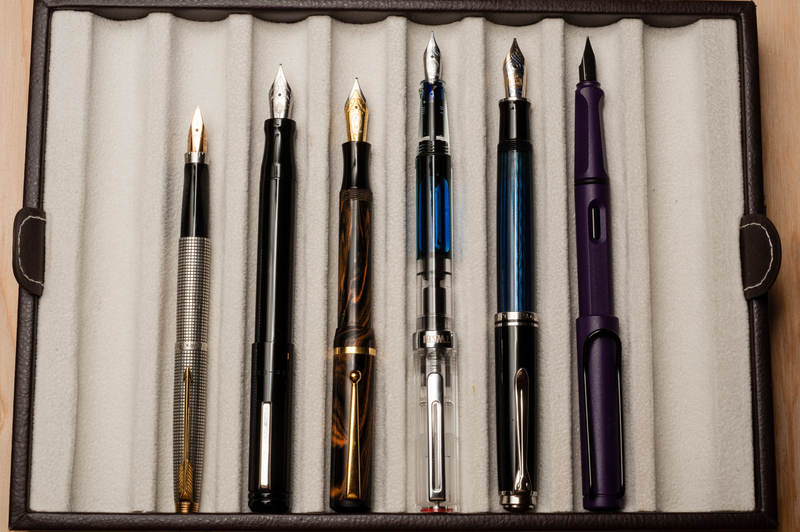 Katherine: At about $150 for the steel nibs, the Spectrum feels expensive. That’s just a little cheaper than it’s gold nibbed Sailor cousins, or the Platinum 3776 at US MSRP (but 2x the 3776 at Japanese prices). The price is my biggest gripe about the pen. 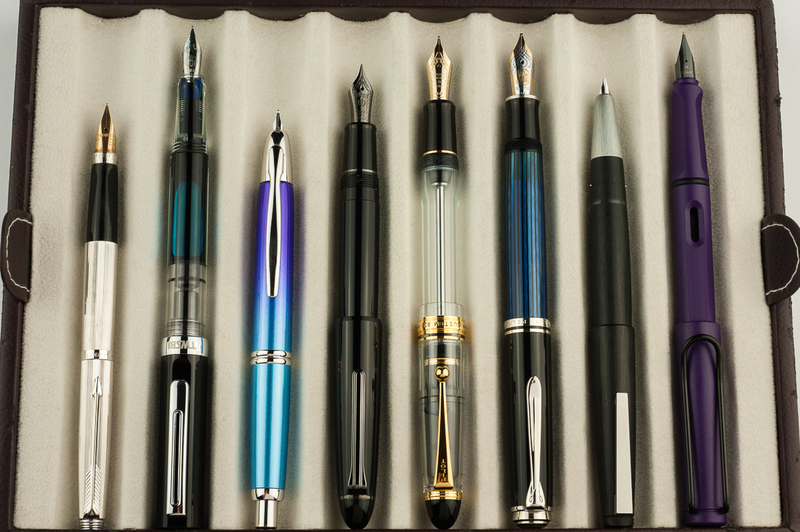 Other than that, I don’t love the aesthetic, but know many people who do, but the pen is a comfortable writer with interesting nibs. If you see one on sale and like the way they look, I wouldn’t hesitate to pick one up! Pam: I really enjoyed playing with this pen. I don’t know if I love the pen for the price. 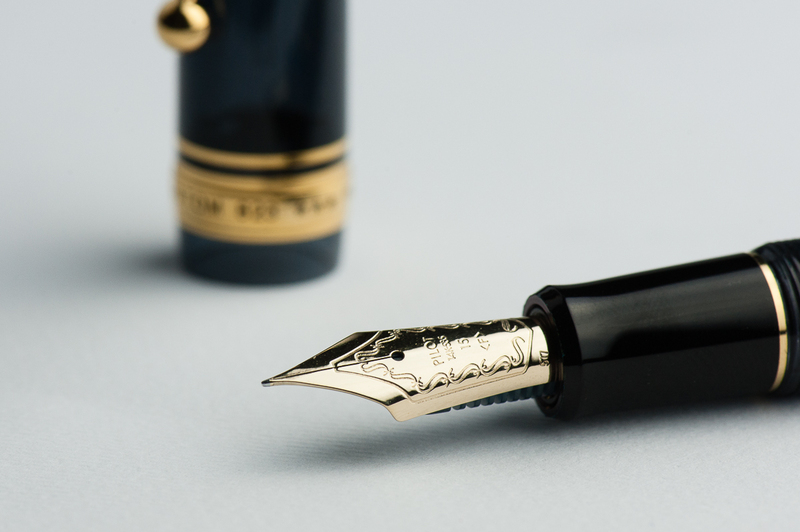 For the $150 for the steel nib, I would consider getting a Sailor Pro Gear Slim and those come with a gold nib. 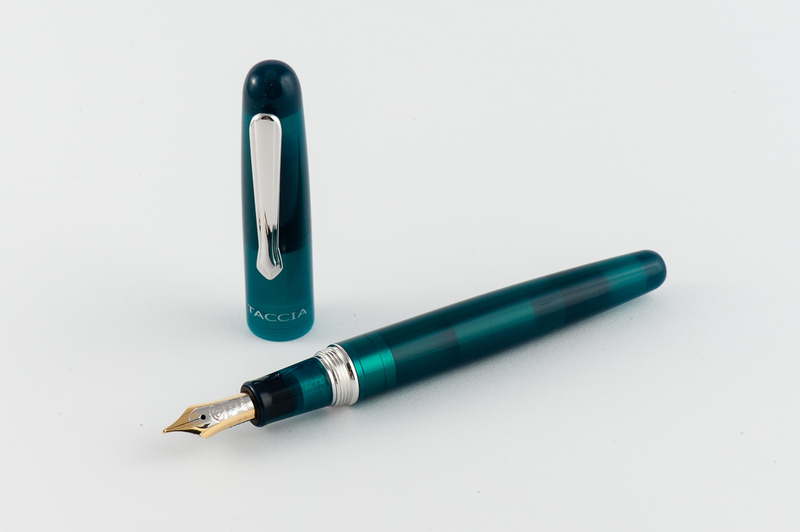 That being said, I really like the performance of the Taccia steel nib and the aesthetics of the pen. 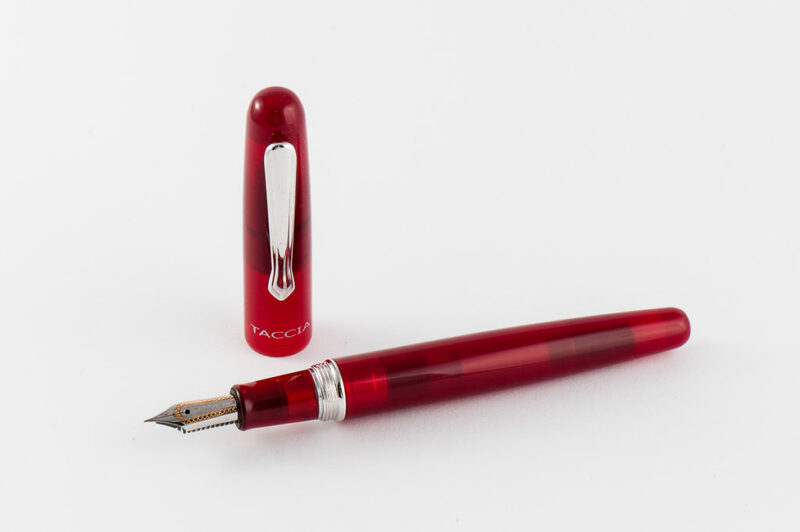 If you are up for a modern aesthetic with a great steel nib and a splash of amazing color, this pen is for you. 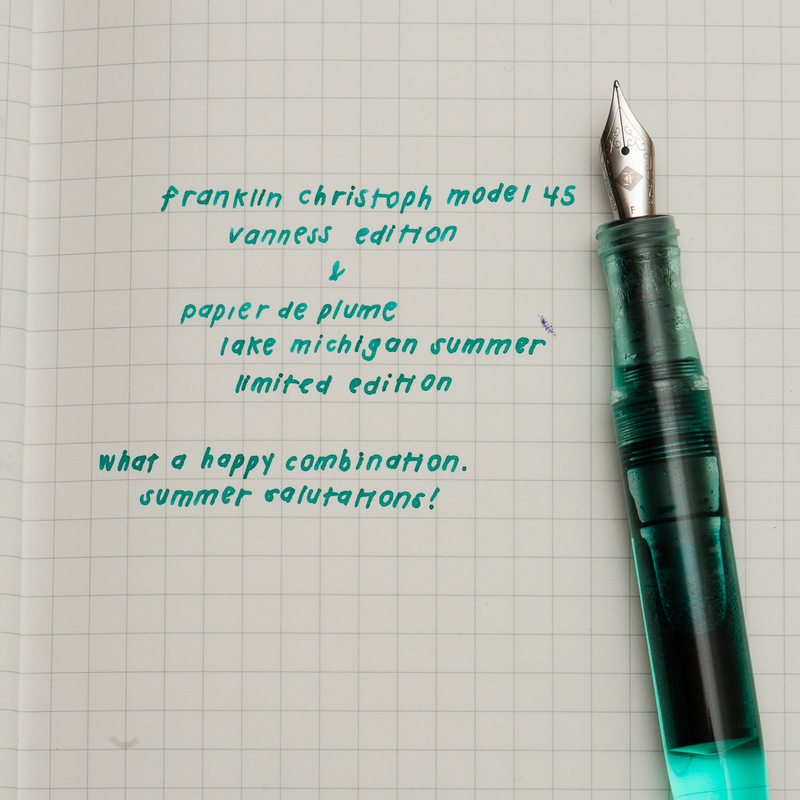 Franz: The Spectrum is a fun, solidly built pen with stunning colors which for me brings value against the offered price. And then their steel nibs are fantastic writers out of the box. The Taccia Spectrum is an awesome pen even if it is a bit small for my bear paw, I probably would get one for myself. I just need to decide between the Forest Green (which is a crowd favorite), or the Ocean Blue (because… blue!). 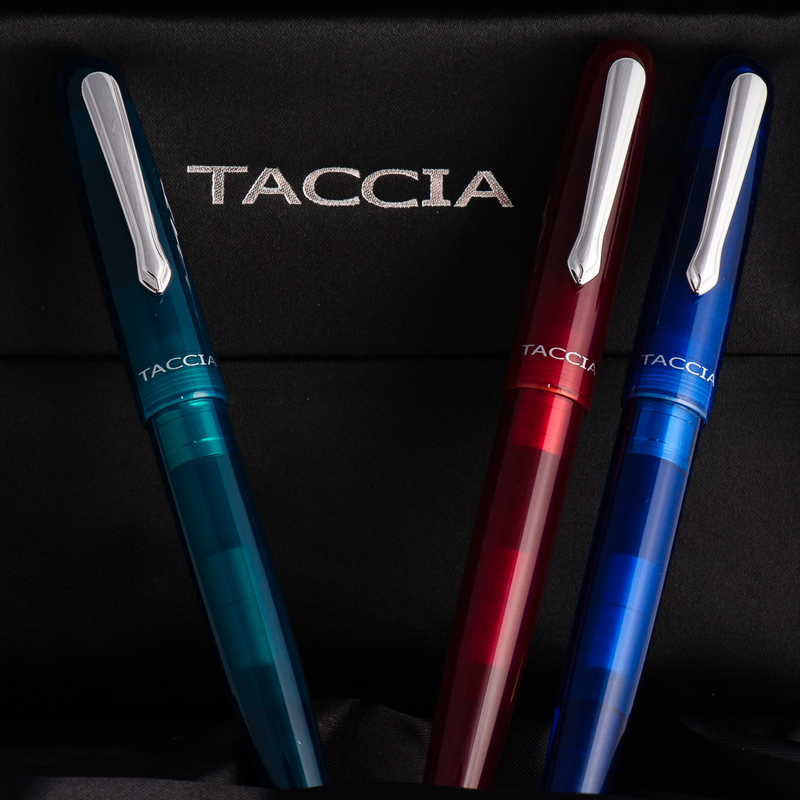 Thanks again to Taccia for lending (entrusting) us these pens and to our pen posse friend, Ron L. for being our liaison to Taccia. 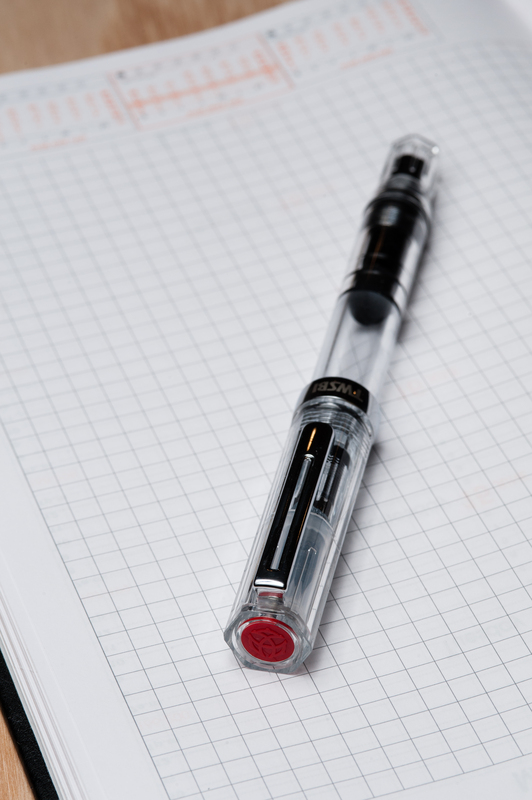 Franz: If I am not mistaken, the TWSBI Eco fountain pen has been in the works since 2013. Fast forward to late 2015, I held an Eco with the black cap and piston turning knob. 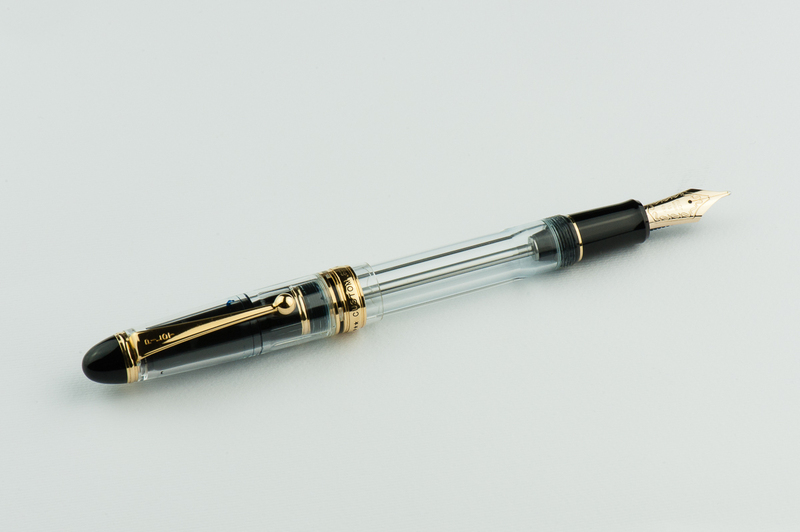 The pen looked cool and reminded me of the TWSBI mini I had. Actually, the Eco’s nib size is the same as the mini. 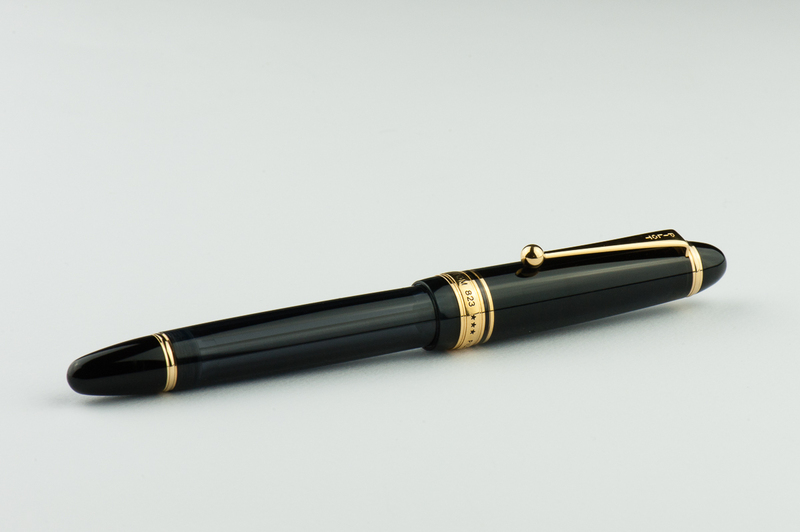 I really like the design of this pen but for some reason, I never got myself to purchase one. Pam’s Eco in the clear version is very nice as well. 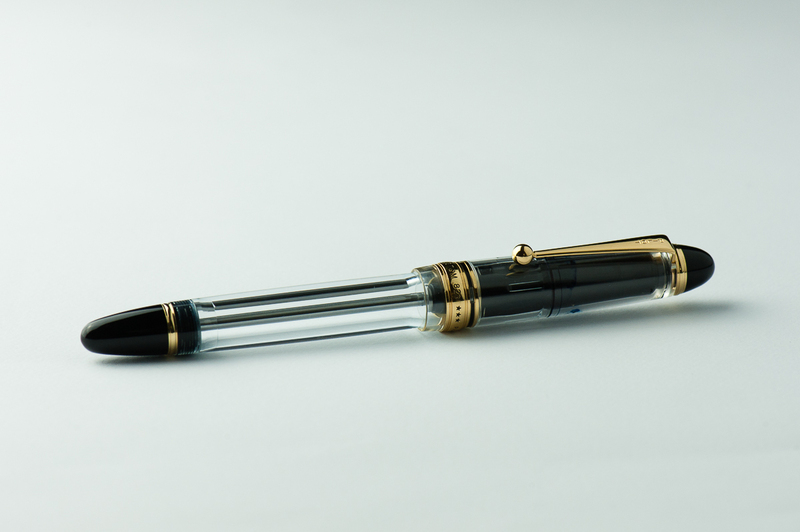 As seen in the photos, it is a piston-filler pen and the capacity is very nice. I really love seeing ink sloshing in the pen as I use it. 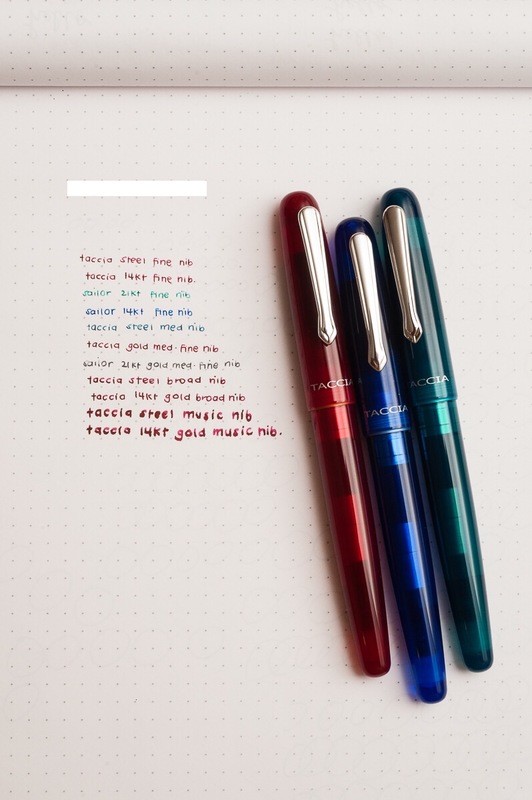 I’m sure that this is not the first time this was said about certain demonstrator pens but I wish that the plastic liner in the cap was transparent. 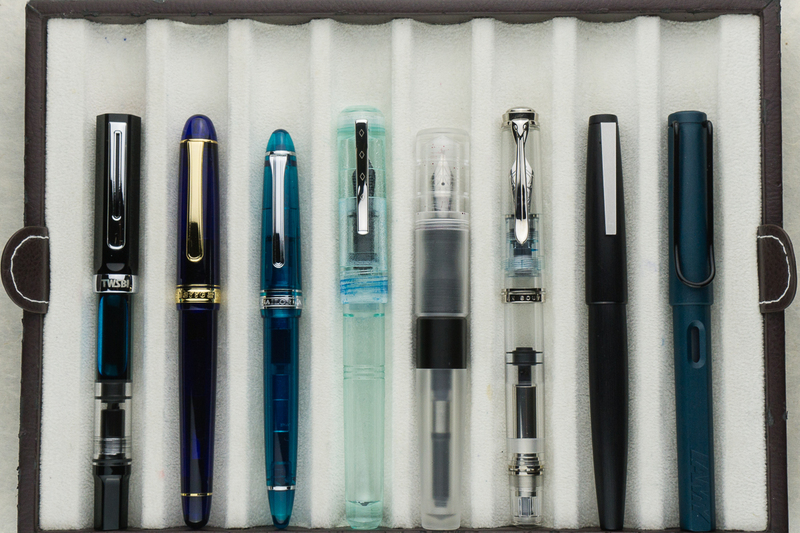 Pam: I have had a TWSBI before. 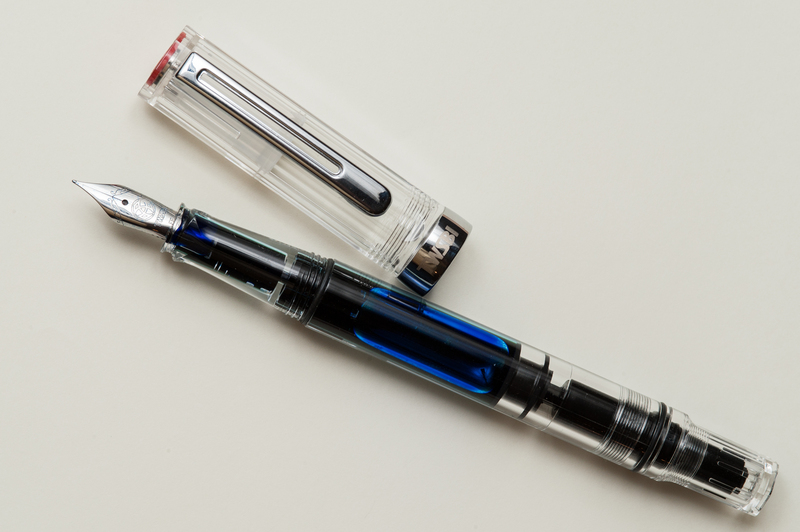 The TWSBI Diamond mini with a fine nib was lackluster to me so I gave it to a colleague who would appreciate it better than I could. 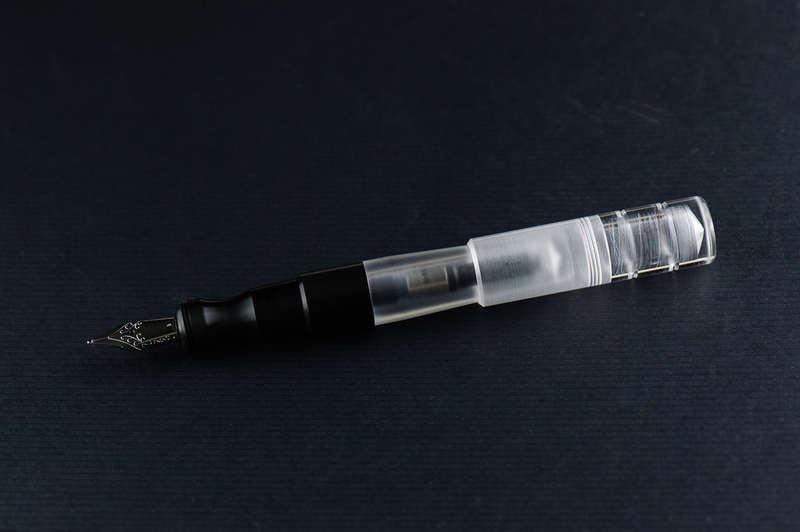 Nonetheless, I was really curious when I saw the TWSBI Eco. 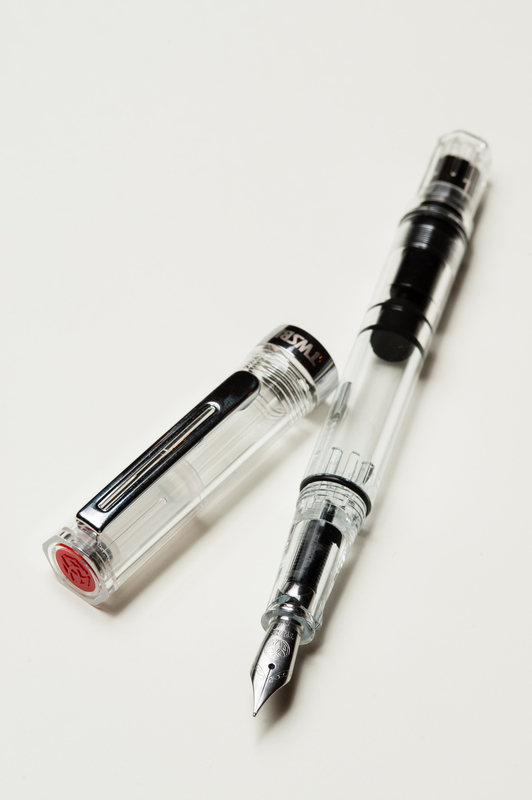 I was very excited when TWSBI released the clear “demonstrator” version of the Eco. It was well worth the wait for this version than the colored versions in my opinion. Given the reasonable price for the look and a decent nib, which I was able to test out at a SF pen posse meet up, I took another leap of faith and bought the pen from Goulet Pens. The length is longer than my preferred length, especially posted, but the plastic is light enough that it’s not crazy bothersome. 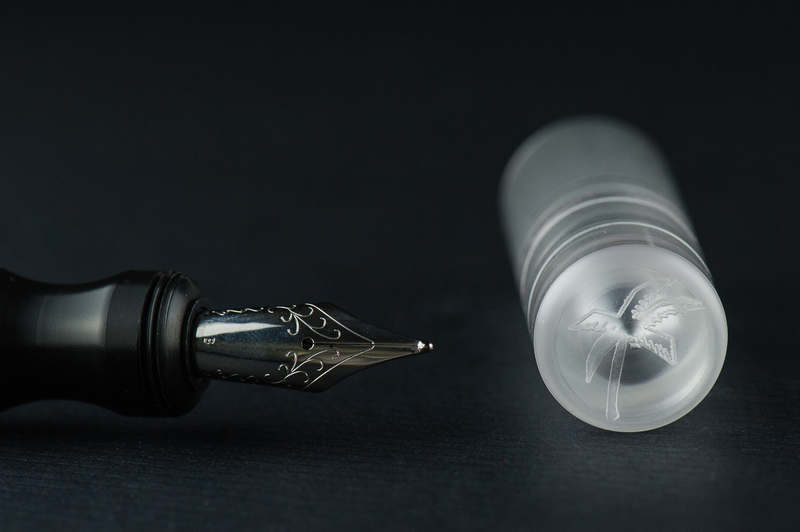 When capping the pen, the plastic-y sound is pretty satisfying and it’s very smooth with each turn. My only complaint for the Eco is that there is only a rubber ring to secure the cap when posting to the back of the pen. It is a cheap but effective way to secure the cap when posting, but it’s not the most aesthetically pleasing and also results in the cap not posting very deeply, leading to a slight imbalance. Katherine: I love the way this pen looks! 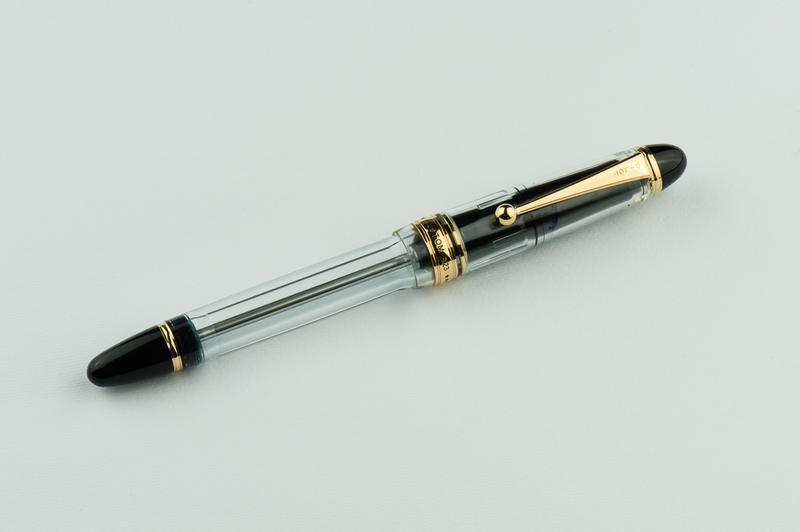 I know this isn’t technically a demonstrator, but everyone seems to use the term to mean “pen you can see the insides of”, so I’ll keep doing that. 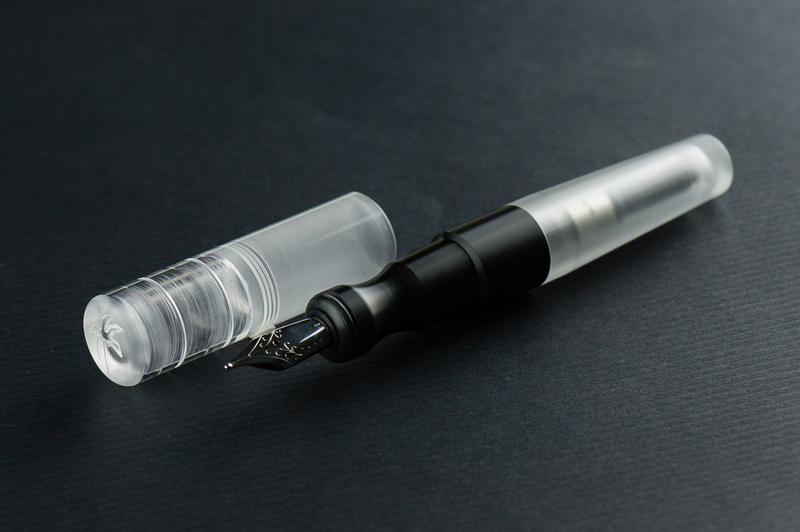 I love demonstrators, and this is a clean looking demonstrator without breaking the bank. 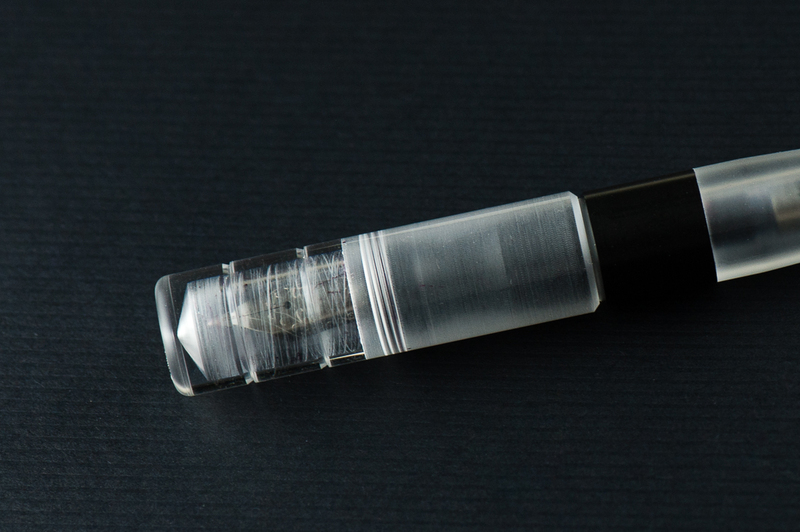 My one nit is that the translucent white liner inside the cap is visible — but it is a pen after all, gotta be functional! 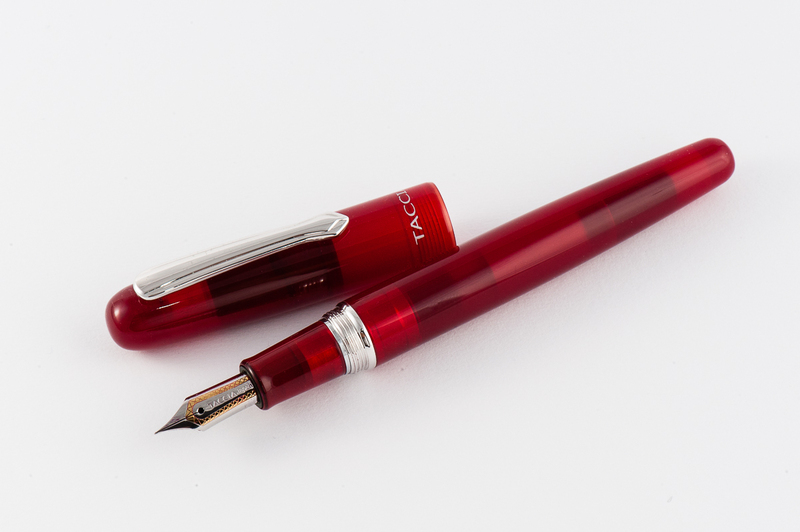 Franz: From prior TWSBI pens I have owned, their nibs have never been a disappointment for me. This is the first time I’ve written with an extra fine from their lineup and this was no exception. It wrote smoothly and the feedback felt nice. 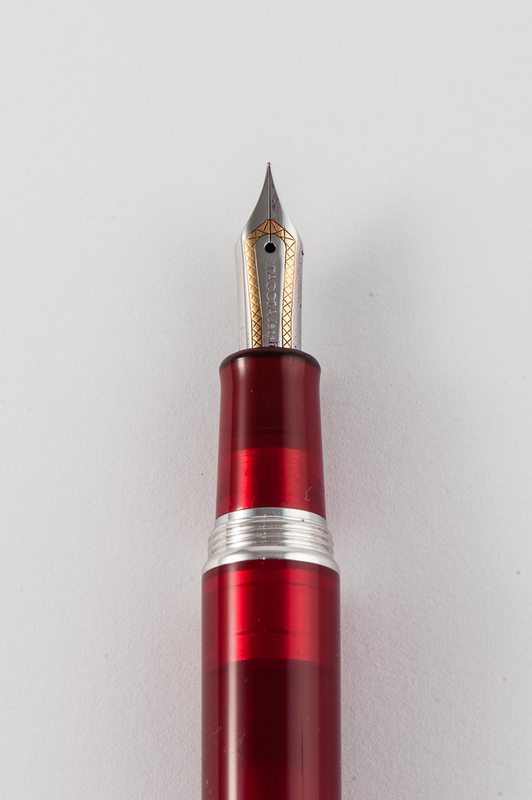 I used the Eco for two weeks and I have not had any negative issues with the nib as it just wrote as it should. 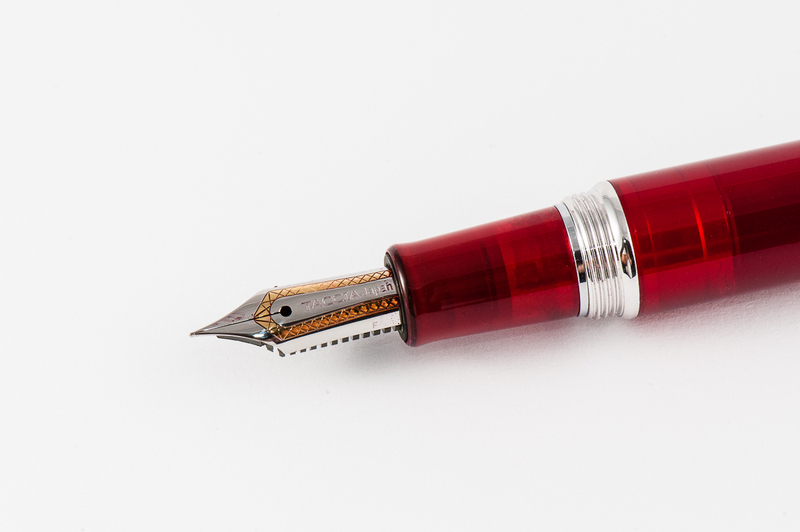 Pam: I wasn’t impressed by my experience with other TWSBI nibs, as they were not the Japanese EF or F that I was looking for. 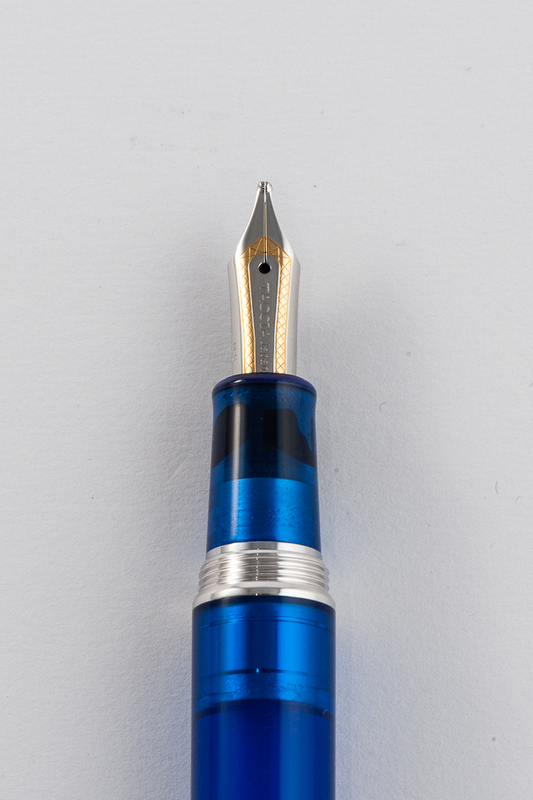 Maybe my taste in nibs are changing, but I find the EF nib on this TWSBI to be a wonderful nib right out the box. It’s more of a Japanese F which works out just fine with me. Inking it up with Franz’s stash of Bungbox Sapphire, the pen provides just enough wetness and line width to enjoy the color and sheen of the ink. I found the nib smooth and really enjoyable to use. 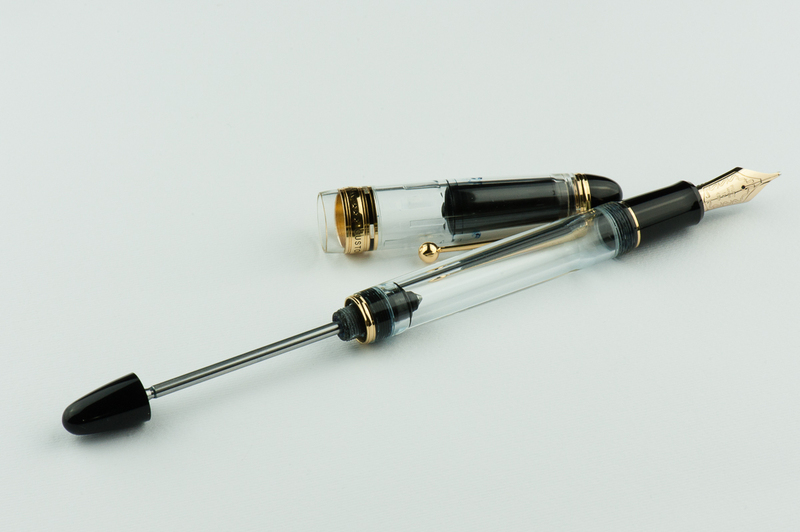 I even considered using this nib and feed unit in a custom pen because the pen itself is too long, but I find myself wanting to use the nib more and more. The nib and ink combination does wonderfully in my Hobonichi and great on Midori paper, however, it feathers on cheap paper. Katherine: This is a very solid nib on a cheap pen. 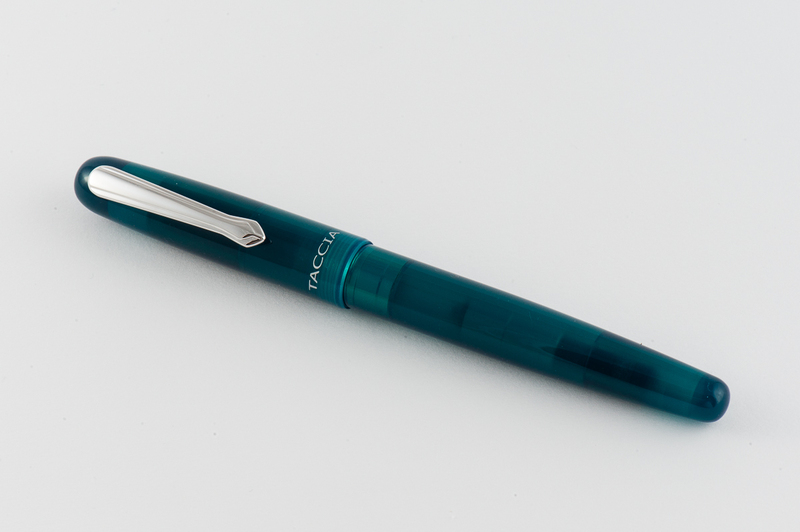 If I bought the Eco as my first pen (instead I got a Metro), I’m not sure I would have ever ventured out to other pens. 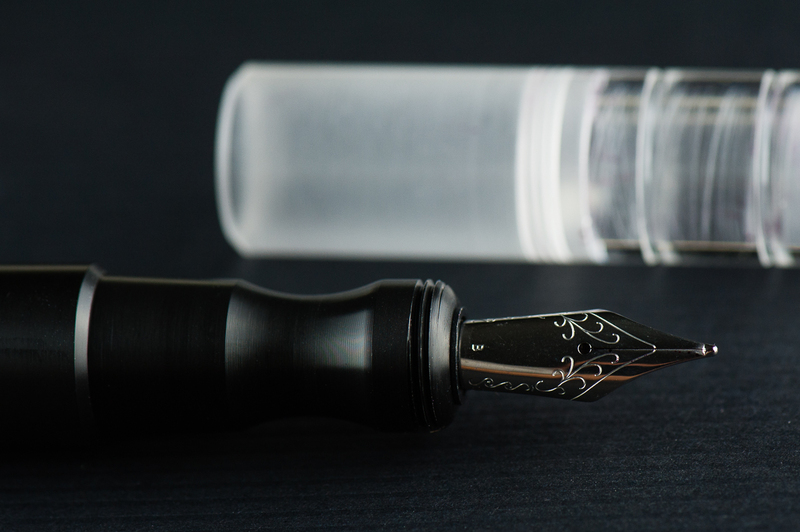 It’s a very comfortable, smooth and wet nib on an affordable pen. I’d compare it to my Metro’s Fine in terms of line width — pretty fine, but not the Extra Fine I’d expect from a Japanese pen (which makes sense, since this pen isn’t Japanese…). Franz: I wrote very comfortably with the Eco posted for the first ten minutes, and unposted the next ten minutes. 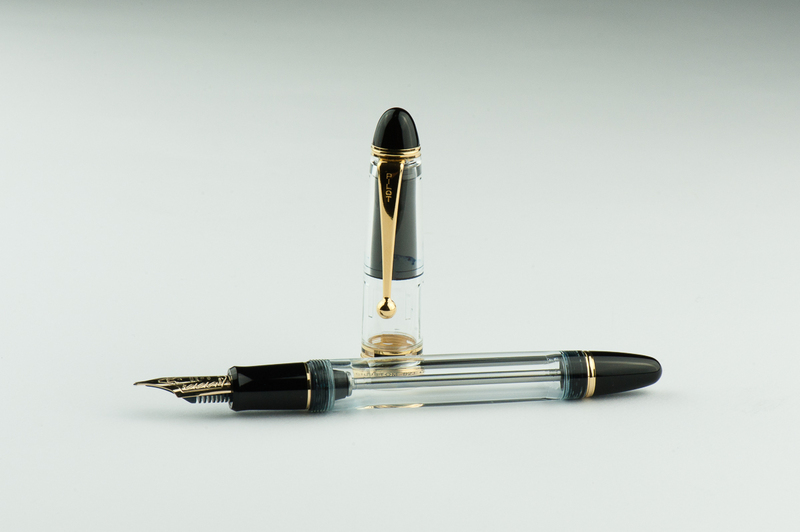 Because of the pleasant nib, and the abundant length of the pen, I did not experience any hand cramps or fatigue. This is a great pen to use for my journal time. If I were to choose, I’d write with the pen unposted because the balance seems better. 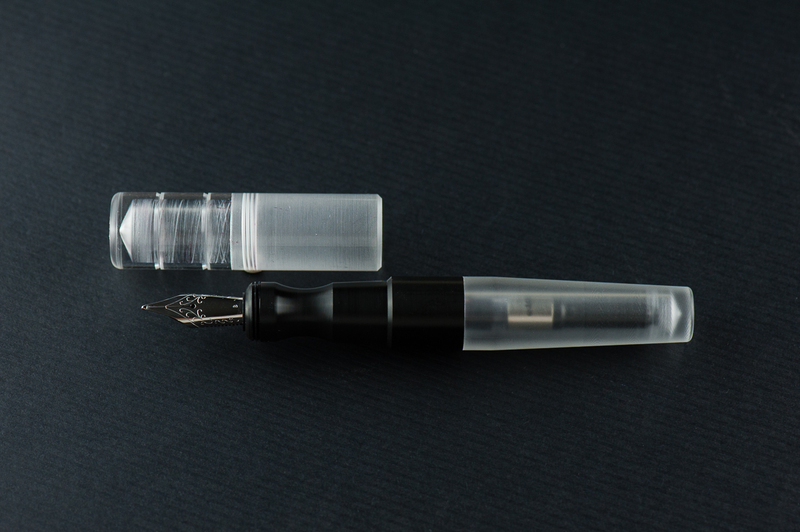 Overall, the writing experience is comfortable as the plastic is light. In my iron grip, the width of the pen is great. 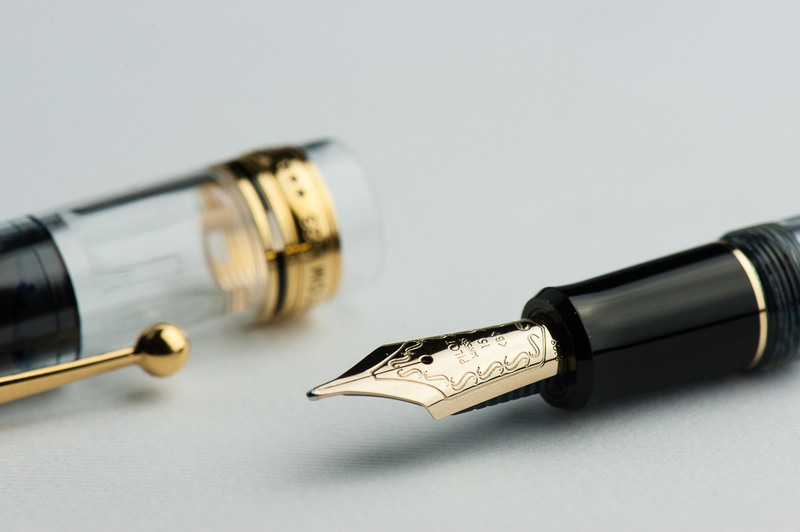 Again, the nib is the best part of the pen and the piston filler filled with ink is beautiful to behold when you are not using the pen. Katherine: The Eco is a little large for me posted, so I wrote with it unposted. 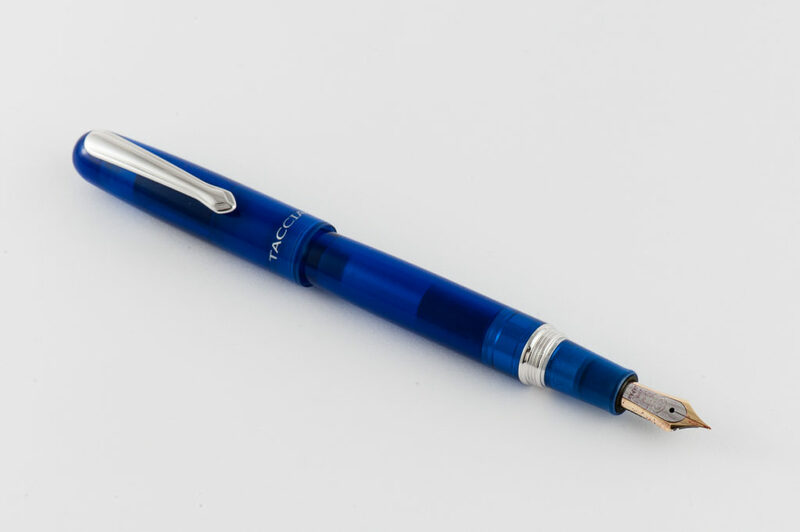 Overall, a comfortable and solid pen. 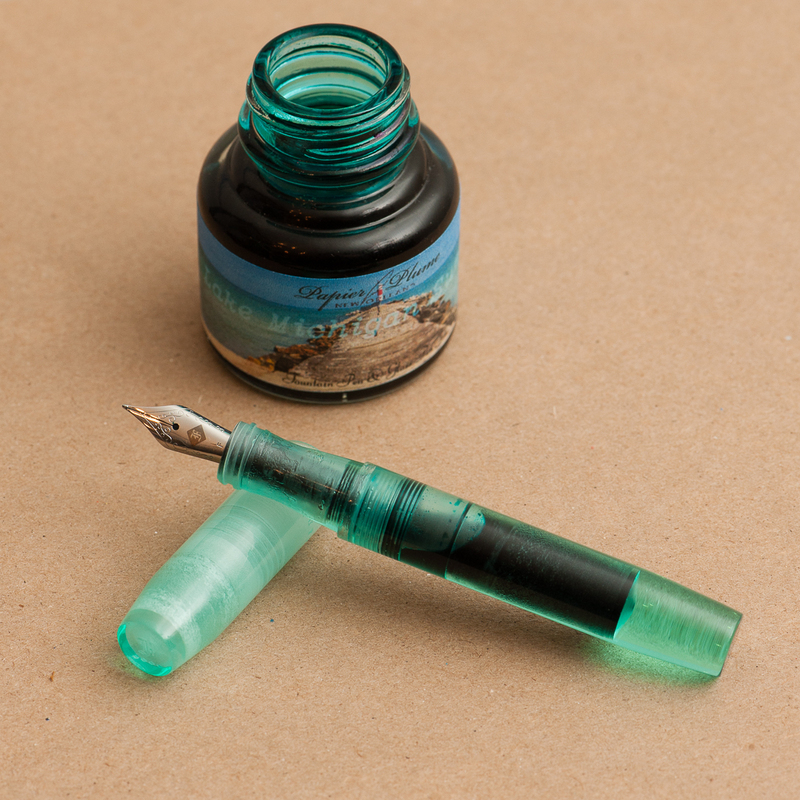 It puts down a fine, wet line that makes it quite comfortable to use, even with more “interesting” inks that sheen. I would have no qualms about this being a pen in my regular journaling or letter writing rotation. An added perk is that it’s fun to watch the ink slosh around and settle as I think about what to write next. Franz: At work, this pen came in handy as the extra fine nib was actually nice to write on the copy paper we use. Unlike the two ladies, unscrewing the cap did not bother me at all. This may be due to my daily use of a Pelikan M805 at work for the past three years. When a pen uncaps in less than one and a half turn, I am actually pretty happy with it. I actually can see myself use this pen on a daily basis. Pam: The Eco has been clipped to the pen loop of my Hobonichi specifically for both quick deployment as well as the longer journaling/planning sessions. The cap is on securely enough that I don’t worry about the pen and planner getting tossed around in my backpack. The plastic isn’t the best material to get scratched up, especially if you enjoy watching the ink slosh around without distracting scratches or scuffs. No scratches on this puppy yet, but I wouldn’t chance it by throwing this pen into the same pocket as my house keys. It is inconvenient for me to use the pen at work due to having to screw the cap on and off. And given that the nib and ink has been feathering, it’s less than ideal for work. This is a great beginner fountain pen and planner companion. 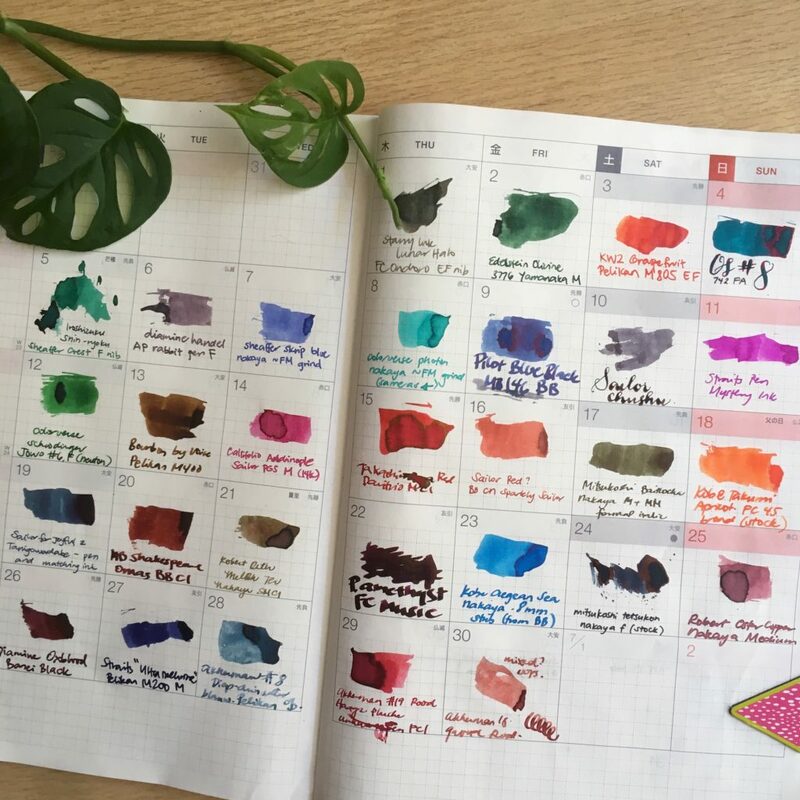 Katherine: I like the Eco at work because it has an easy to see ink capacity (big plus so I don’t run out of ink partway through a meeting before… it’s happened before), it’s cheap (I’ve never lost a pen, but there could be a first!) and it’s comfortable to write with. The one downside is that the cap takes more turns than I’d like to unscrew. As I’ve mentioned before, I tend to be pretty stop-and-go with my note taking at work, so being able to quickly uncap and cap a pen is a big plus for me. 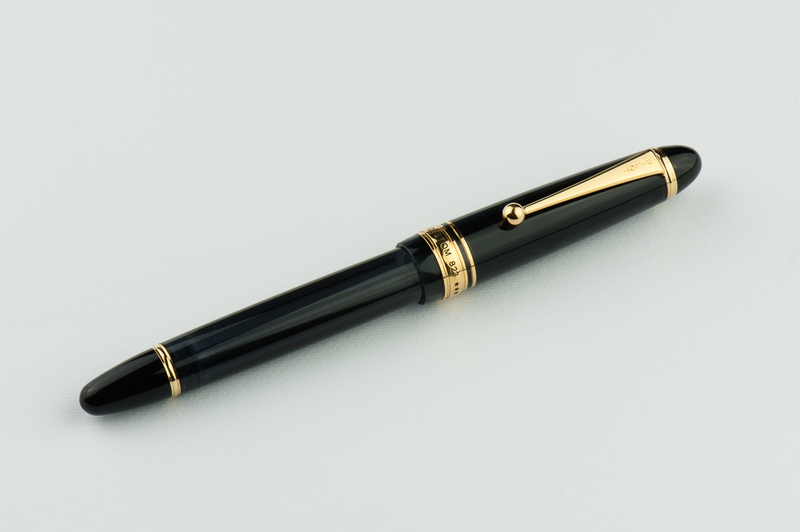 Would I recommend this as a first fountain pen for newbies? I would probably recommend it to be a second or third pen to own. 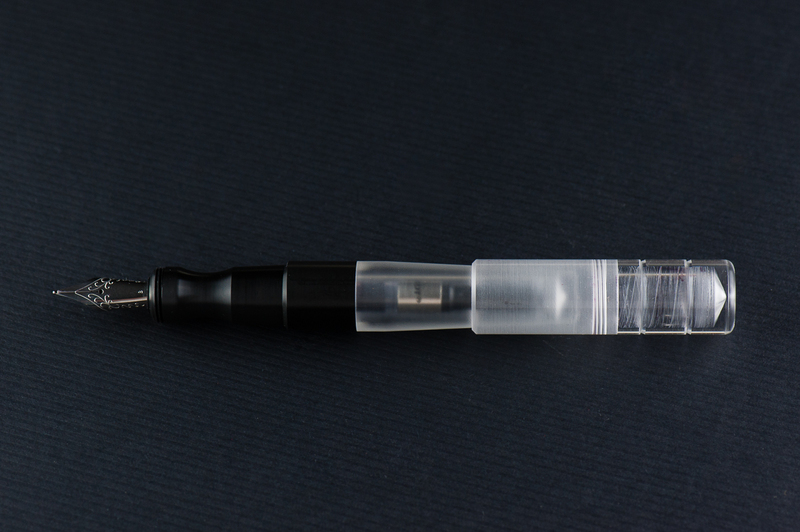 When I started, I got a cartridge/converter as a first fountain pen and I appreciated the fact that I can just insert the supplied cartridge and write. 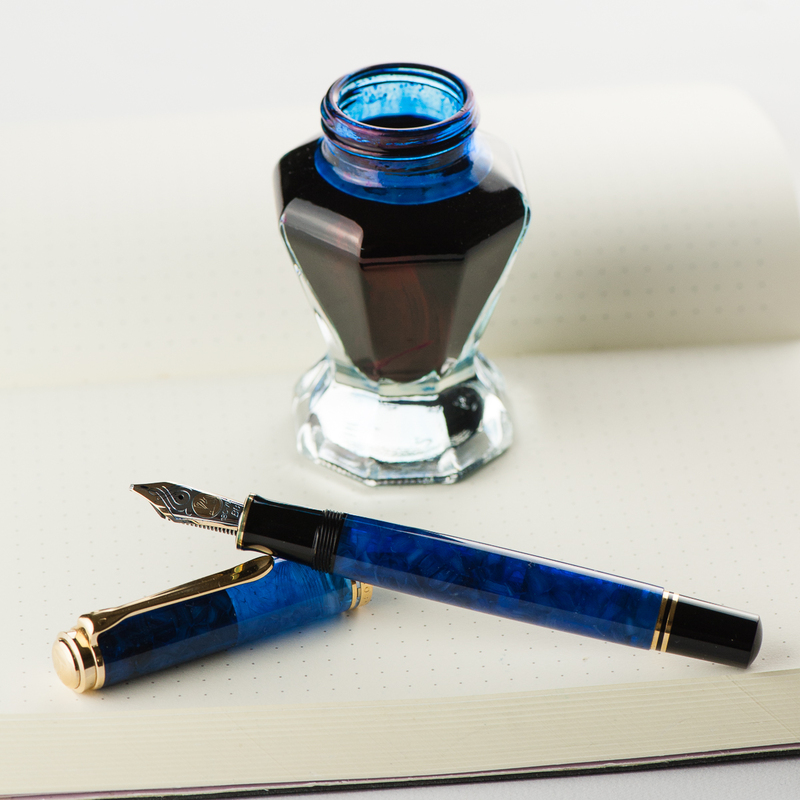 It took me a couple weeks to buy my first ink bottle (Waterman’s Serenity Blue) and filled up my converter with it. 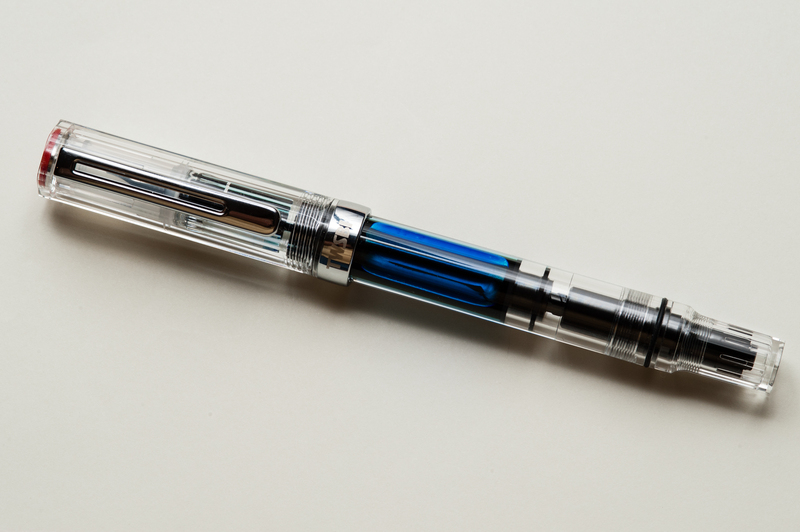 Anyway, I am quite impressed by the TWSBI Eco and I’ll probably purchase one. 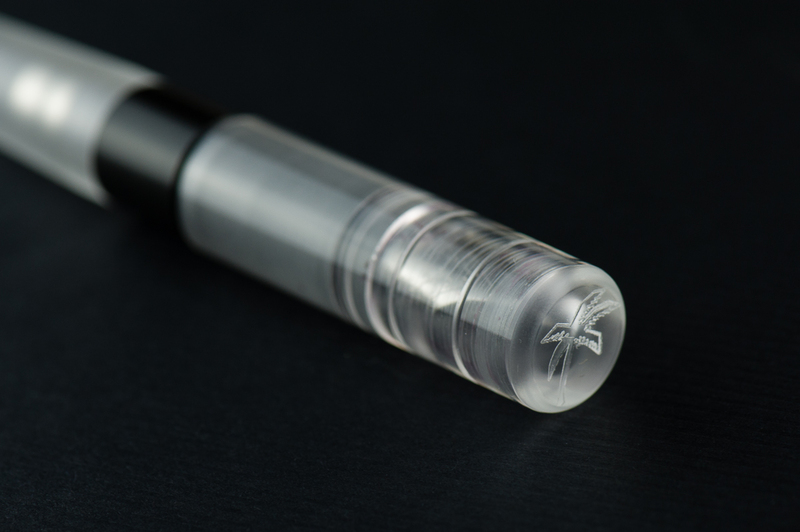 I just need to decide between the clear or the black version of this pen. Thanks Pam! 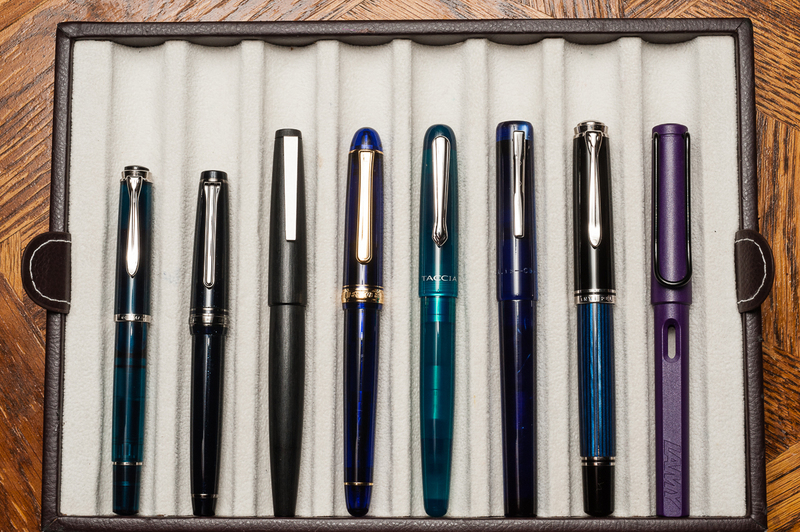 Pam: Katherine has a self imposed 15 pen limit where as the Eco convinced me to have a “beginner pen” collection. It’s also my excuse to keep the TWSBI Eco. 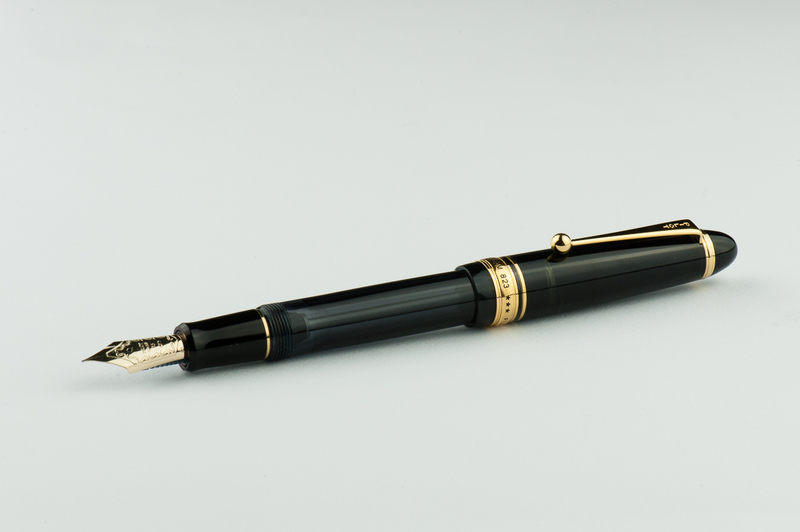 (There goes those rationalizations again…) This will be, of course, in addition to my “completed” grail pen collection. 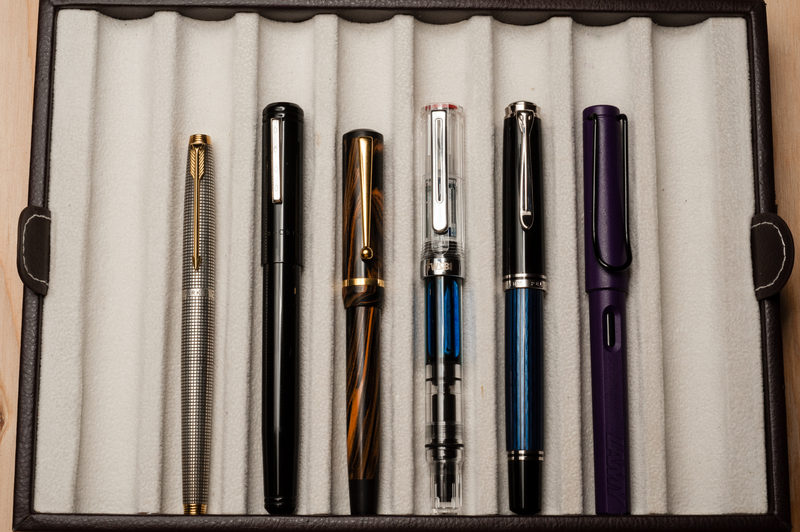 I enjoyed the Metropolitan and the Safari, but in terms of performance and aesthetics the Eco is my favorite of the three. 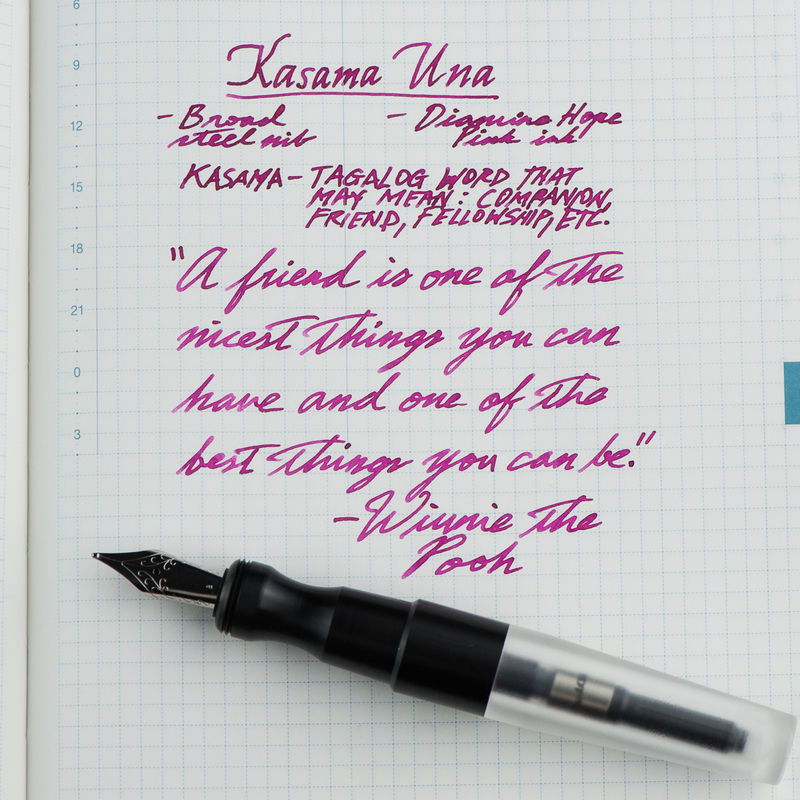 A $29 piston filler with such good steel nib beats the Lamy Vista by miles. The comfort and EDC-ness of the Eco has the Metopolitan beat hands down. 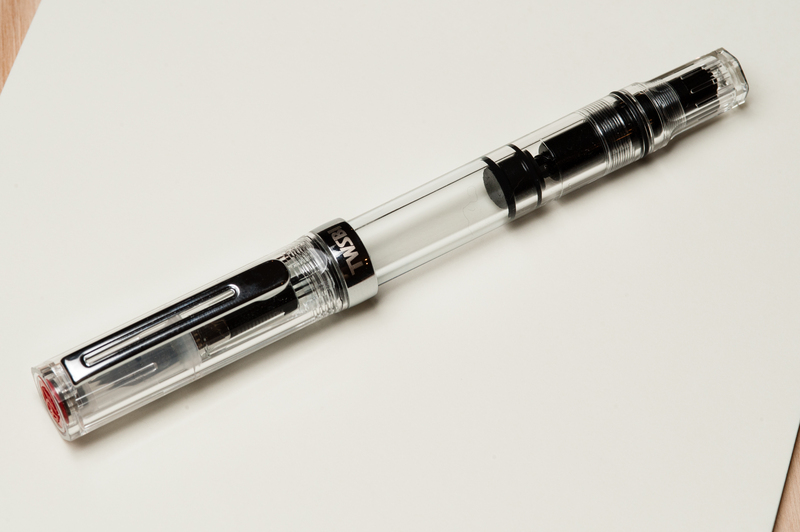 TWSBI really did hit it out of the park with the Eco. I have finally been converted to a TWSBI fan! 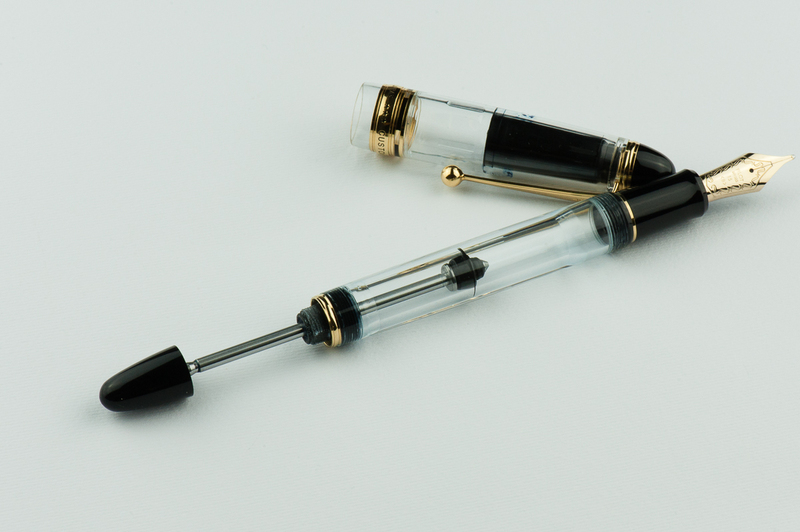 Maybe this nib should go into a custom pen body after all… it’s just too much fun! 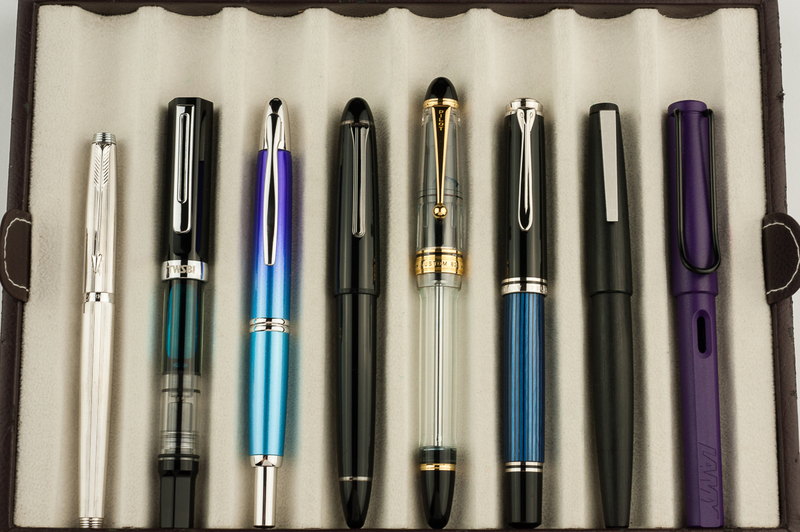 Katherine: As previously mentioned, if the Eco was my first fountain pen I may have not ventured further into the world of fountain pens. But, it wasn’t, so instead I’m here blogging… Back to the Eco — it’s a very solid and nice pen for the money. 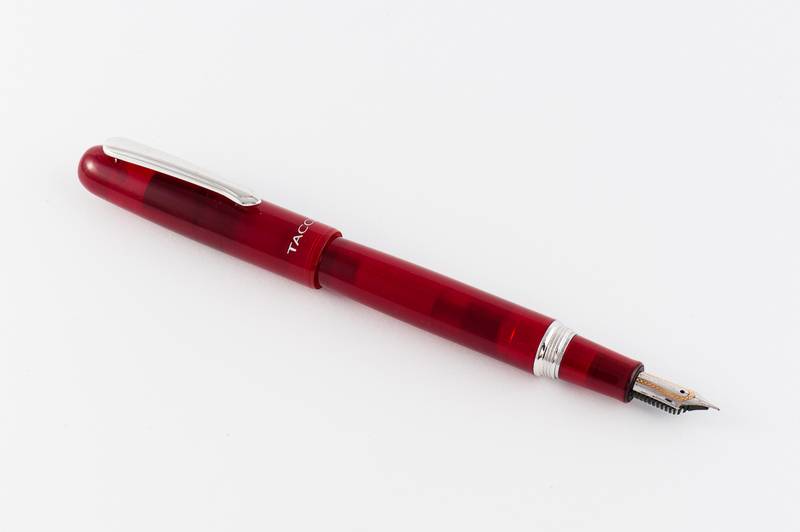 The writing experience doesn’t have a lot of character, but it’s a great workhorse pen. 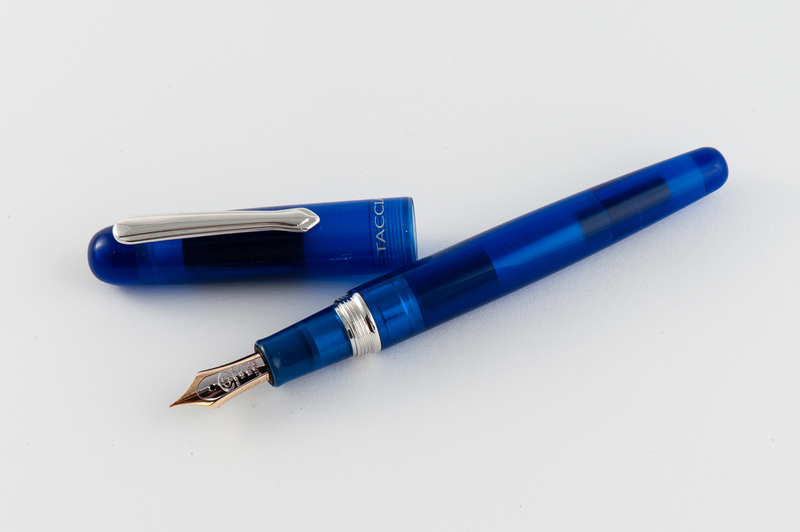 For this review, I borrowed Pam’s Eco, but I’m seriously considering purchasing my own. In the end though, it’s not a pen with a lot of character so I’m not willing to “cut” another pen for it.